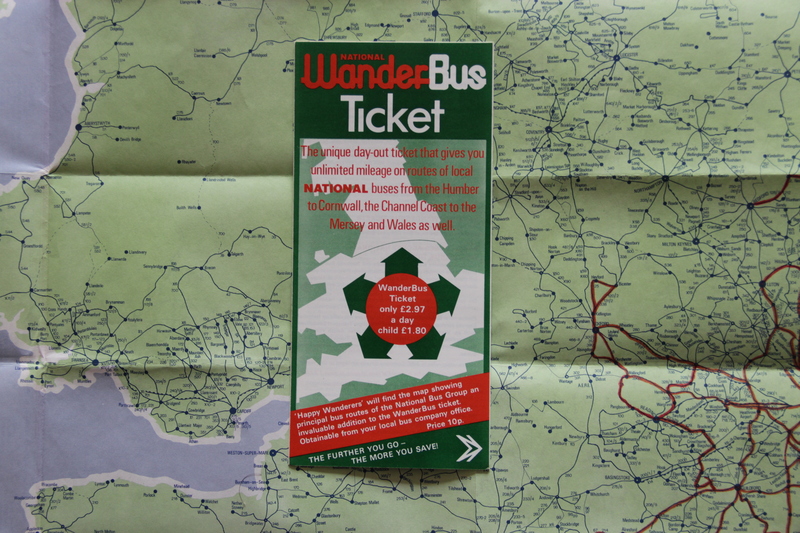 For those of us whose lust for buses was equalled with a lust for a day out this surely was the ultimate product, the ‘National Wanderbus’ ticket, launched by the state owned National Bus Company in 1978. 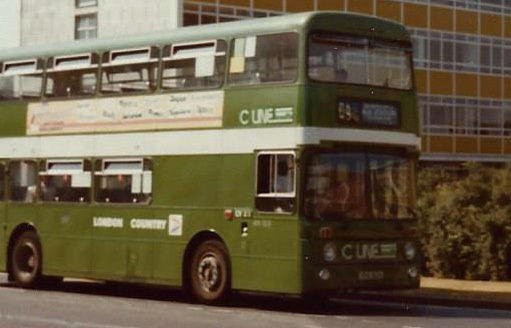 Many of the individual NBC companies offered similar products such as London Country’s ‘Golden Rovers’ or Southdown’s ‘Busranger’ tickets but these were generally only available for use on those operator’s services. 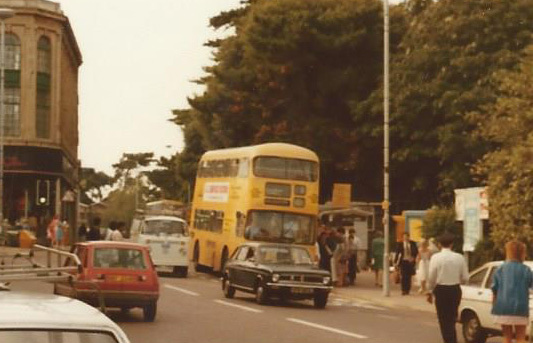 The ‘National Wanderbus’ allowed you to cross the boundaries from one operator’s territory into another. 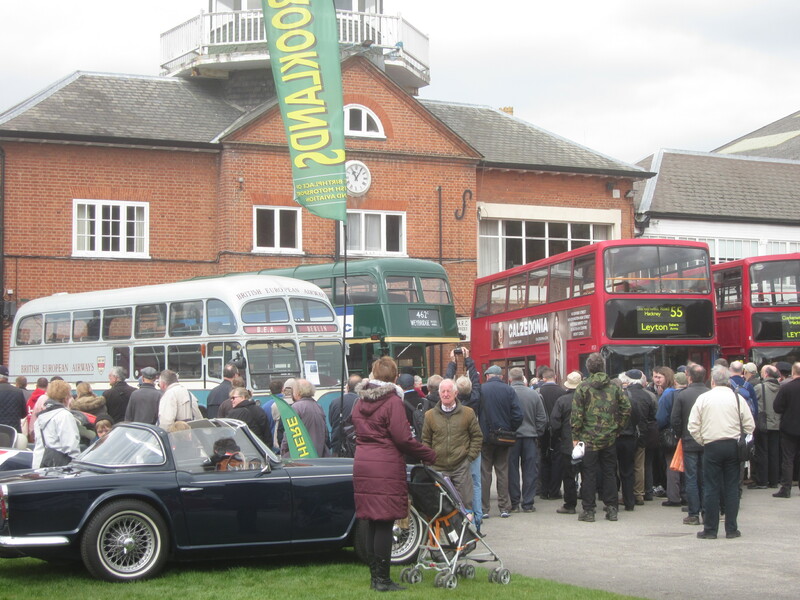 With some careful planning using the NBC’s excellent ‘Principle Bus Links’ map a good day out on the buses was guaranteed for a mere £2.97. 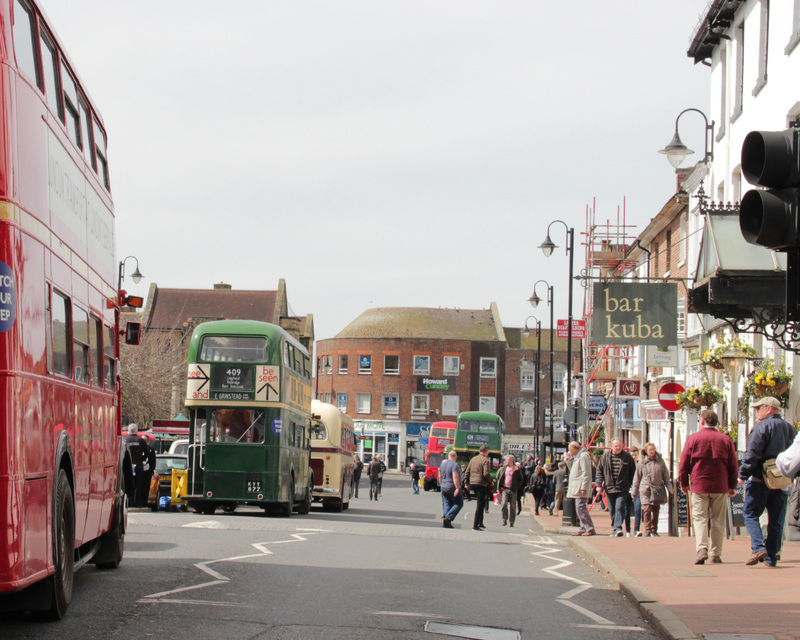 Living in Crawley where I was largely restricted to London Country, the ‘Wanderbus’ could now give me easy access to Southdown, Maidstone & District, East Kent and Alder Valley. 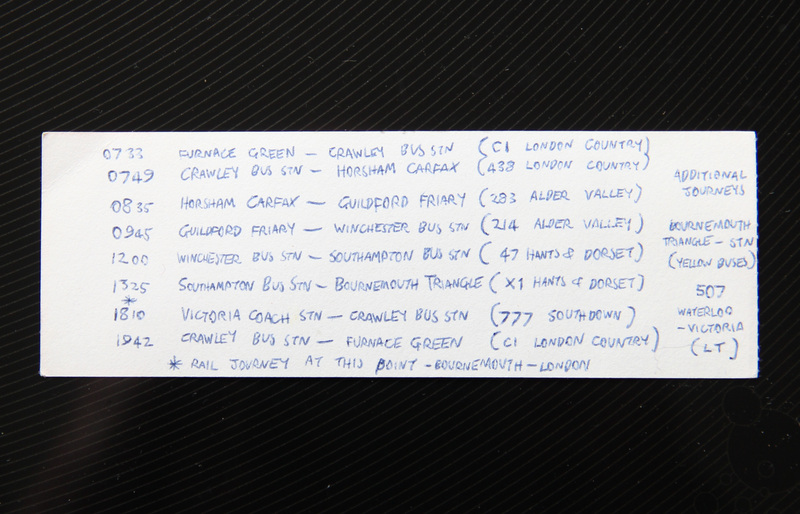 For the first time I could travel for miles in any direction on one ticket. 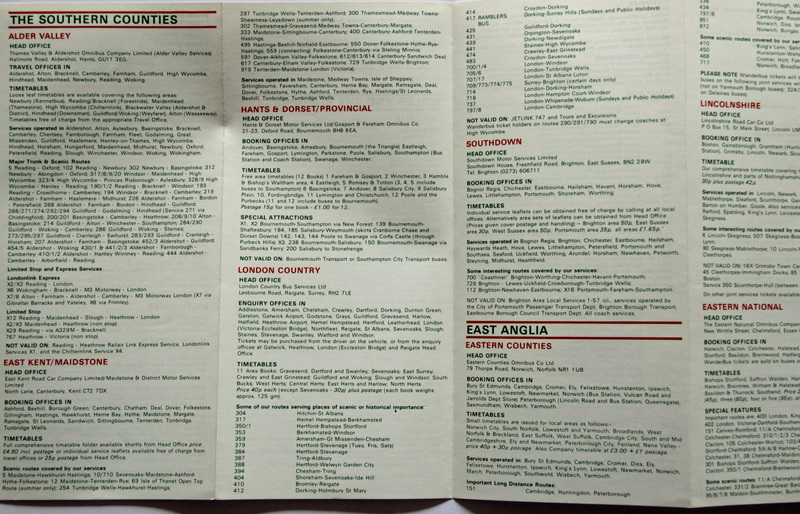 The individual NBC subsidiaries list their availability in the ‘Wanderbus Ticket’ leaflet. 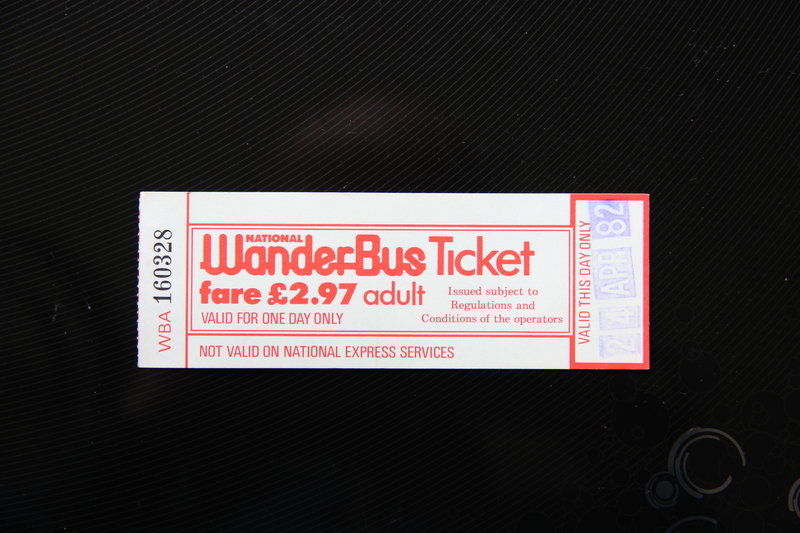 ‘Wanderbus’ tickets were issued as a pre-printed card available from enquiry offices who would stamp the date of validity on them meaning that you could buy them in advance, useful if you wanted an early start the following day, there being no time restriction on the use of the tickets. 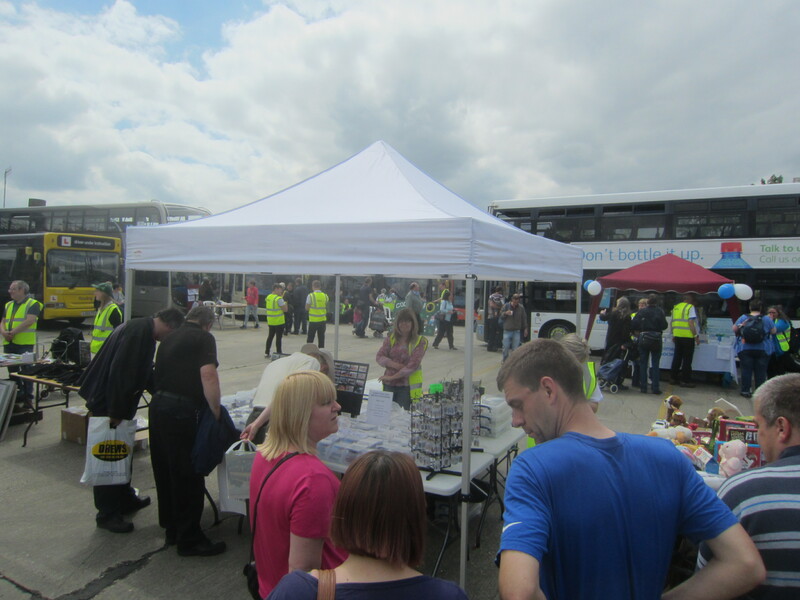 You could also buy them on the bus, although not all operators offered this option. 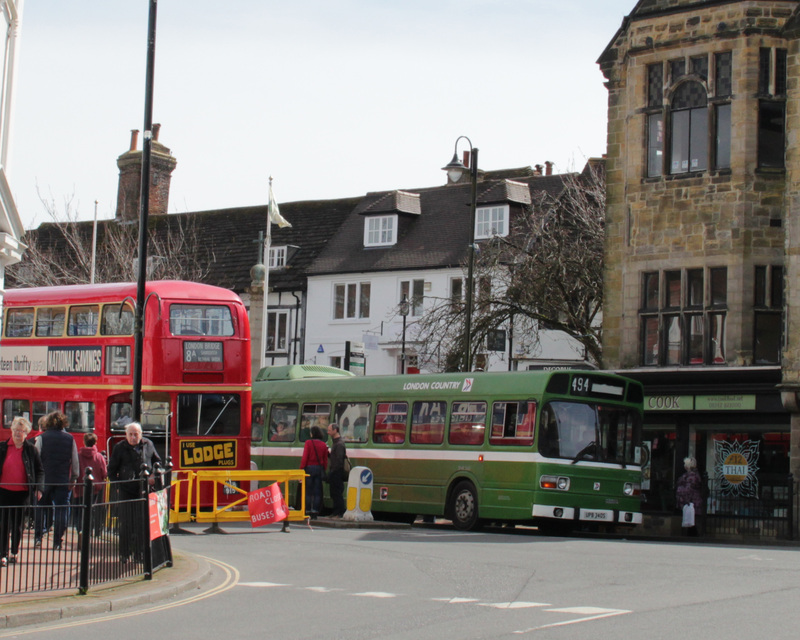 Many older ticket machines in use at the time could only issue tickets to the maximum value of 99p, so the driver simply issued three ’99p’ tickets, hence the price tag of £2.97. 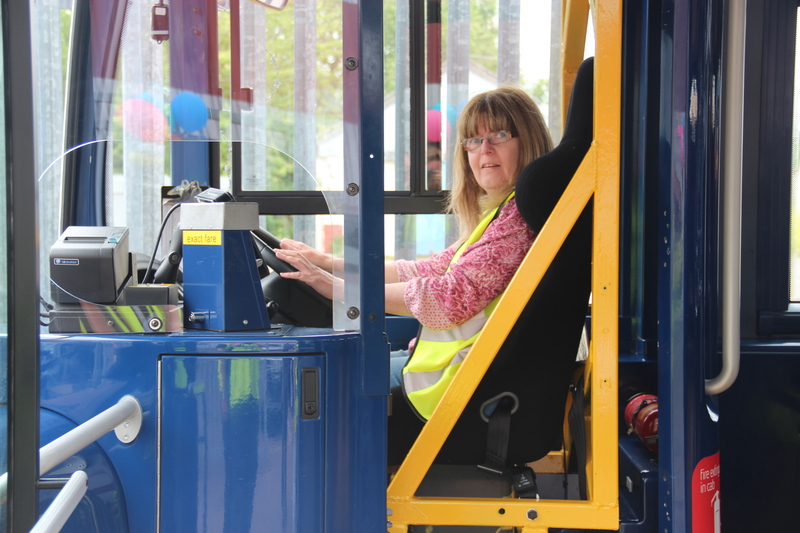 There were certain restrictions. For some reason they were only available south of a line from the Humber to the Mersey, leaving the likes of Yorkshire Traction, East Yorkshire, Ribble, United, Northern General and Cumberland out of bounds. 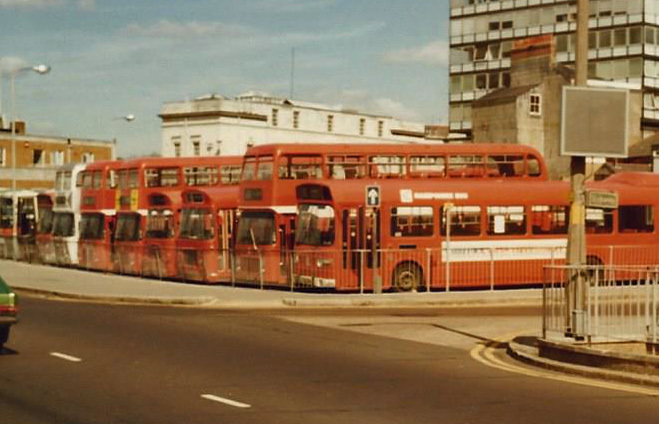 The tickets were not available for use on National Express coaches, neither could they be used on London Transport buses or municipal services (council or corporation buses), although arrangements did exist between some NBC companies and local councils such as Eastern National and Southend Transport, or Western National and Plymouth City Transport where there was joint running. 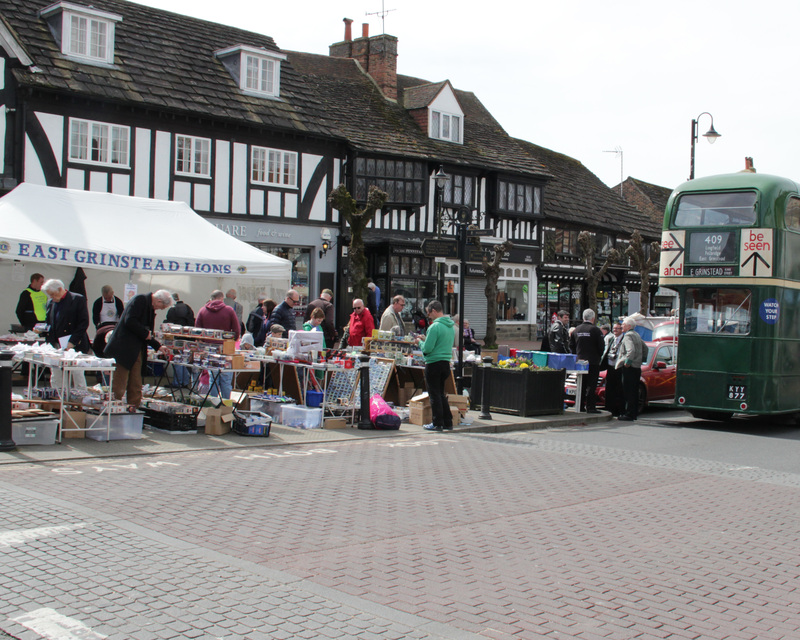 Some also came to similar arrangements with local independents where they could provide links with the main NBC services. 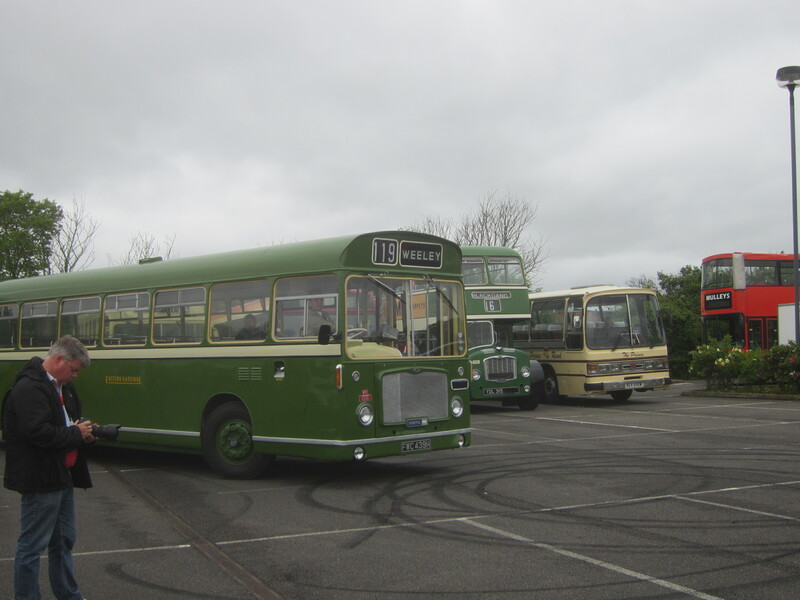 Southern Vectis on the Isle Of Wight opted out of the scheme, preferring to stick with their ‘Island Rover’ which they ran jointly with British Rail. 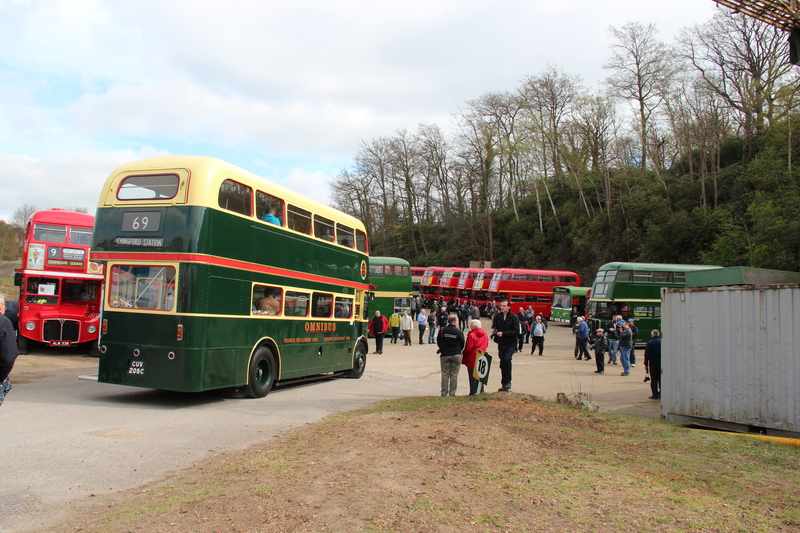 Generally though, if the bus was poppy red or leaf green with the NBC double ‘N’ logo it was yours for the taking. 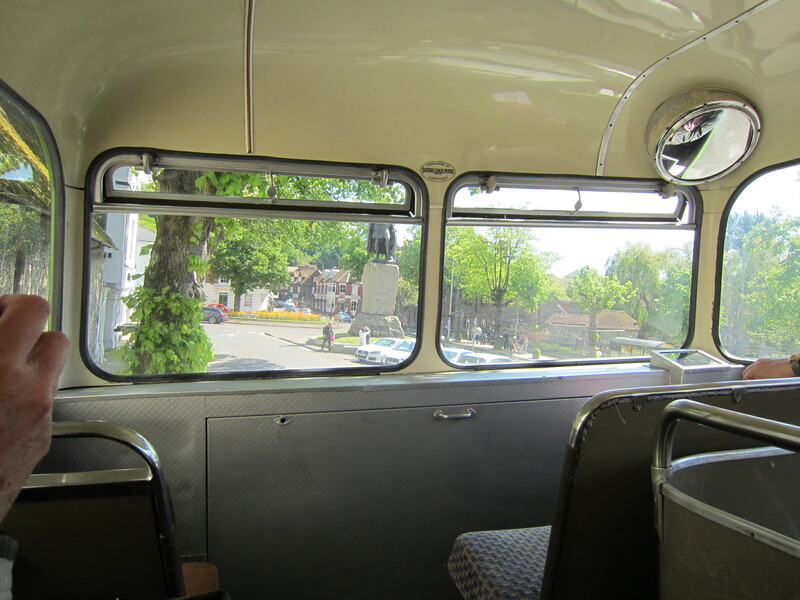 If you were on holiday in another part of the country, the ‘Wanderbus’ offered a superb way to explore the area. 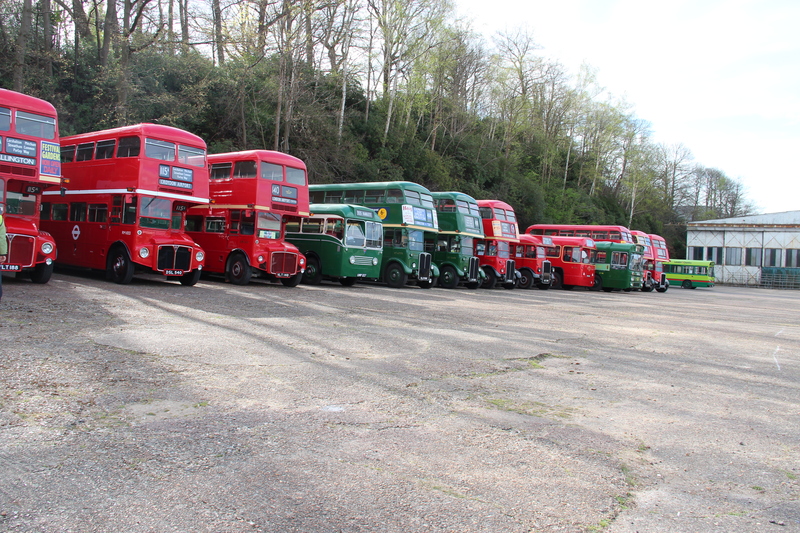 A selection of NBC buses await your custom….. 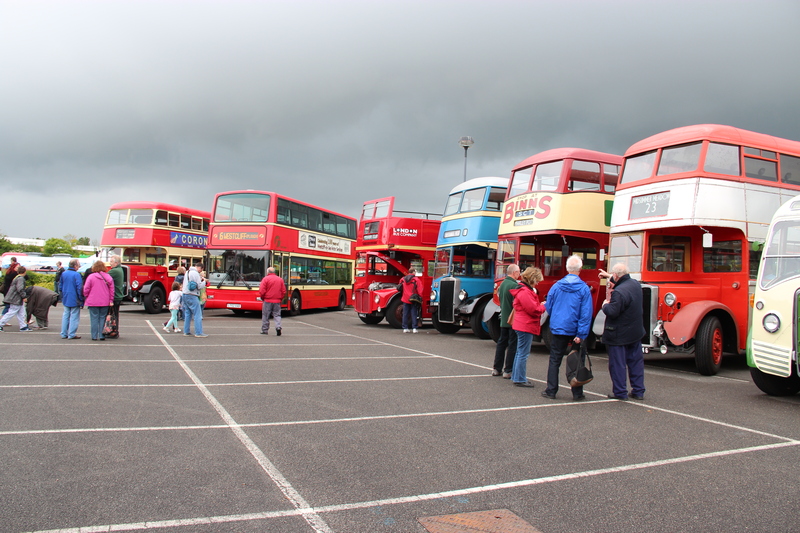 Your ‘Wanderbus’ day out starts here. 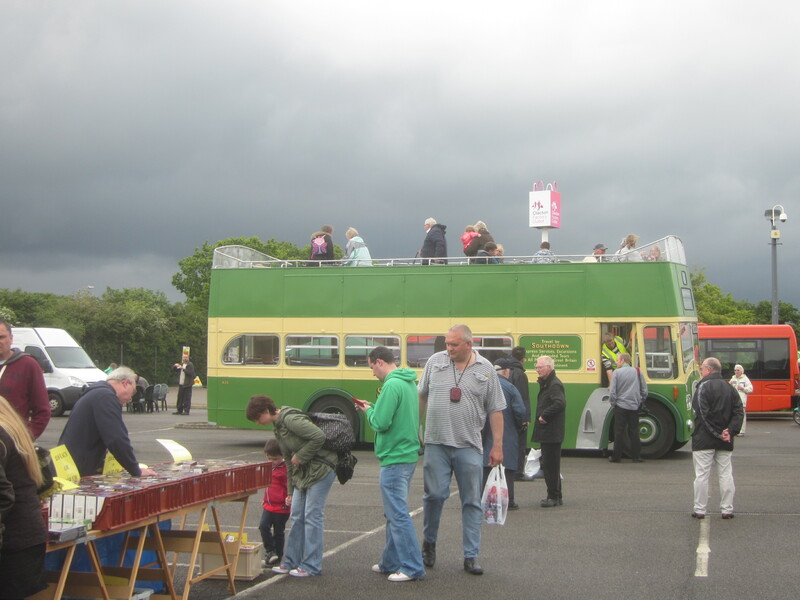 Sadly, ‘Wanderbus’ tickets were not immune from the individual politics of the operating companies. 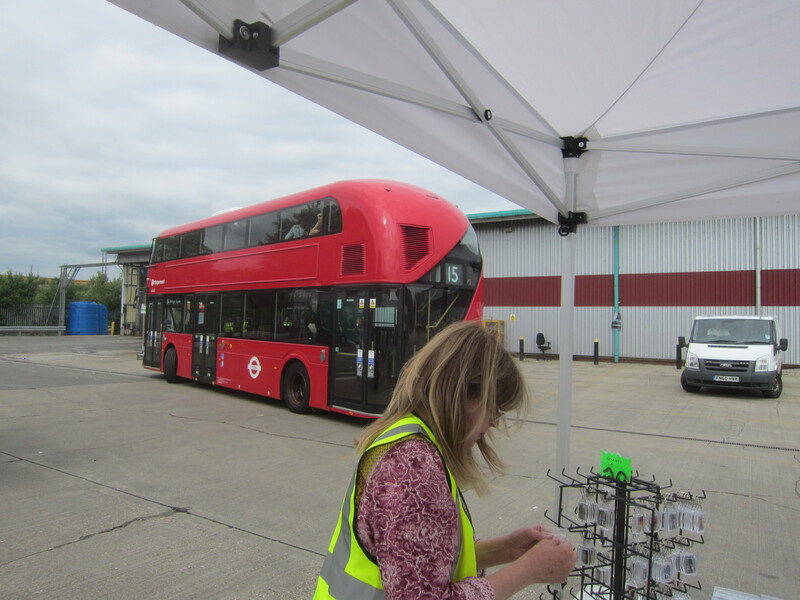 Some operators stopped issuing the pre-printed cards, but not all of them issued them from machines as I discovered one morning when London Country couldn’t sell me a ‘card’ ticket but Southdown (operator of my first bus of the day) couldn’t sell me a ticket on the bus. 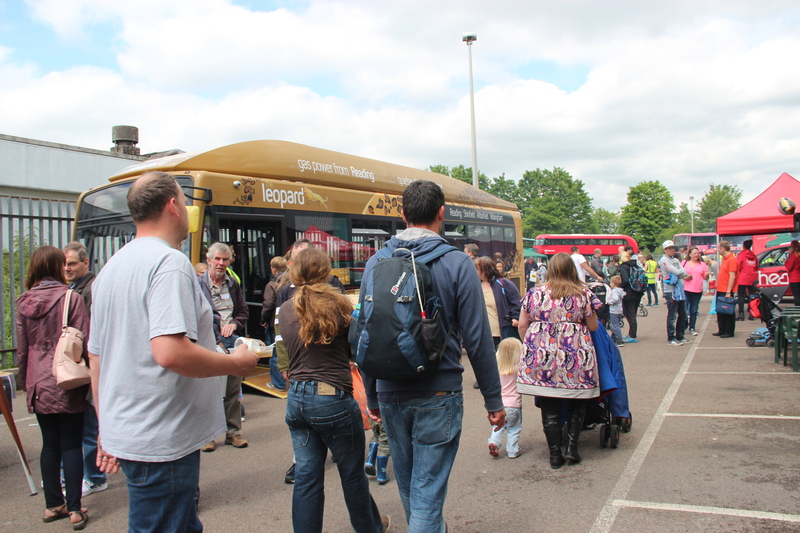 On another occasion City Of Oxford wouldn’t let me use my LCBS machine issued ticket on their fast 190 Express, unless I had a ‘card’ ticket I had to use the slower 390/790 services between London and Oxford. 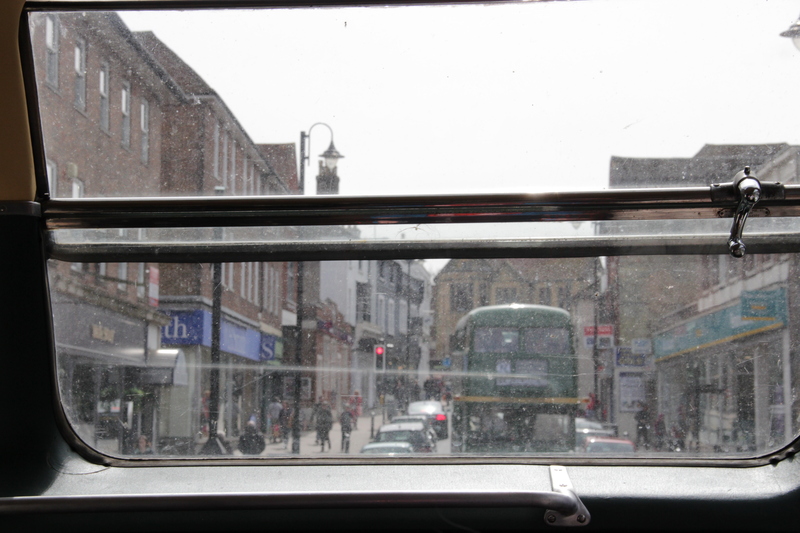 The view from within a Western National Bristol VR, the staple double decker on a ‘Wanderbus’ day out. 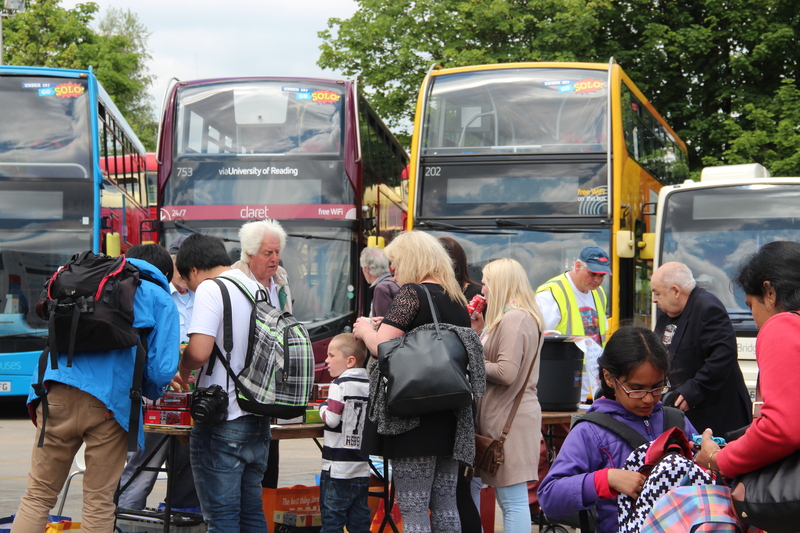 However, it appeared that most sales of ‘Wanderbus’ tickets were to those of us who were bus ‘savvy’, the differing policies of the various companies meant it was not user-friendly to casual users or tourists. 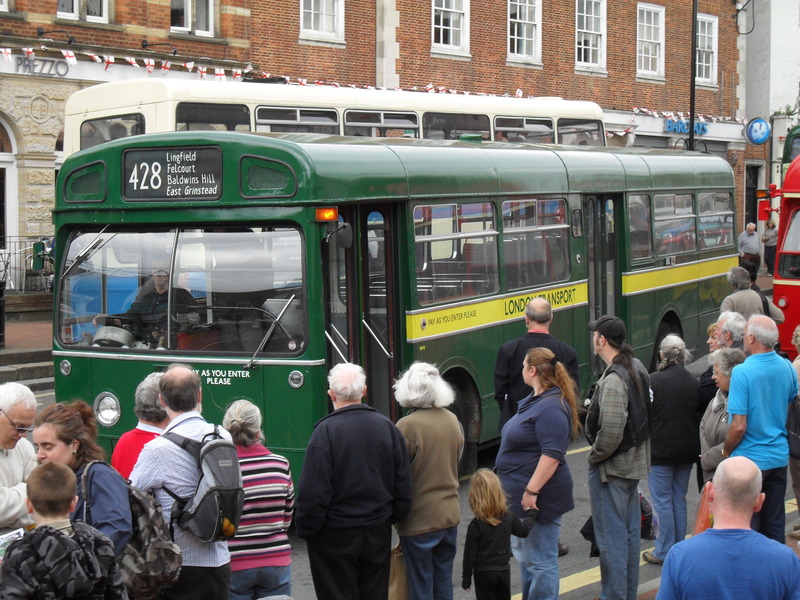 It’s possibly for such reasons that the ‘Wanderbus’ was gradually replaced by the ‘Explorer’ ticket in the early ‘eighties, sold in the form of a scratchcard which could be bought in advance and validated by ‘scratching out’ the required travel date and usually came with a leaflet suggesting places of interest or scenic round trips from the local operator(s). ‘Explorer’ tickets outlived the NBC, surviving today in their new guise as ‘Discovery’ tickets. 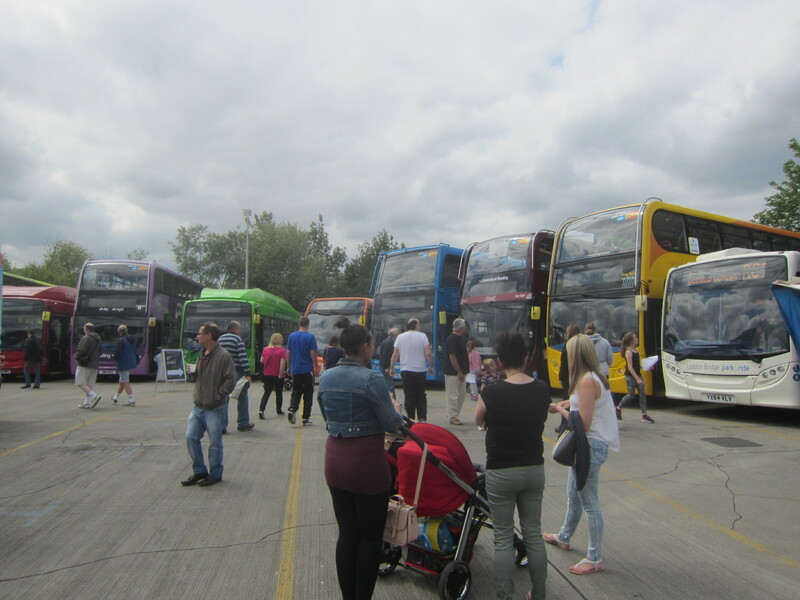 But they too are vulnerable to the policies of the private companies, some not accepting them at all leaving large gaps in the network, rendering them unattractive to the non-bus ‘savvy’ who just want a simple round trip. 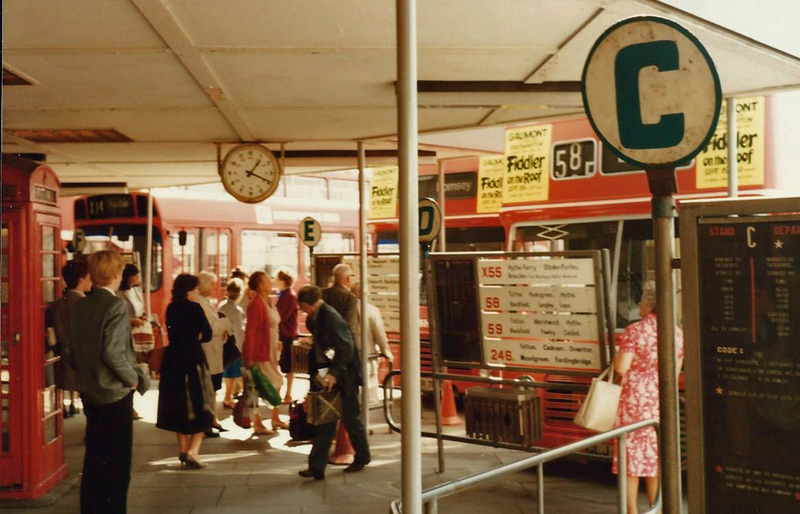 The days of seeing a National bus and hopping on it just to see where it goes and knowing there will be an available connecting service at the other end are sadly behind us. 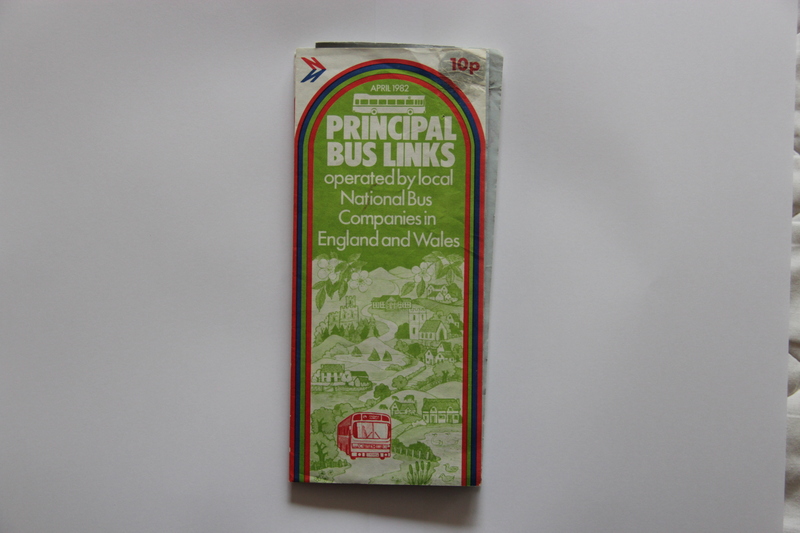 NBC’s useful’Principle Bus Links’ map leaflet, essential for planning a day out, bearing in mind that only the southern half was available to ‘Wanderbus’ tickets. 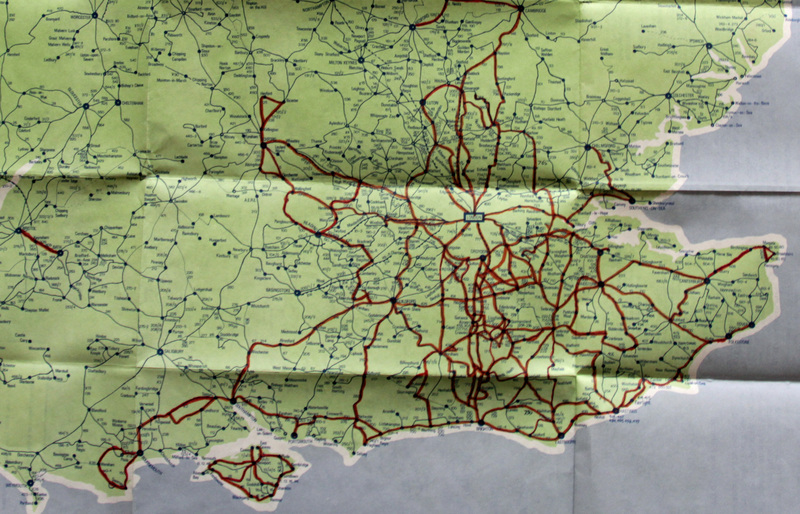 My copy of the map with my ‘Wanderbus’ journeys lined in red. 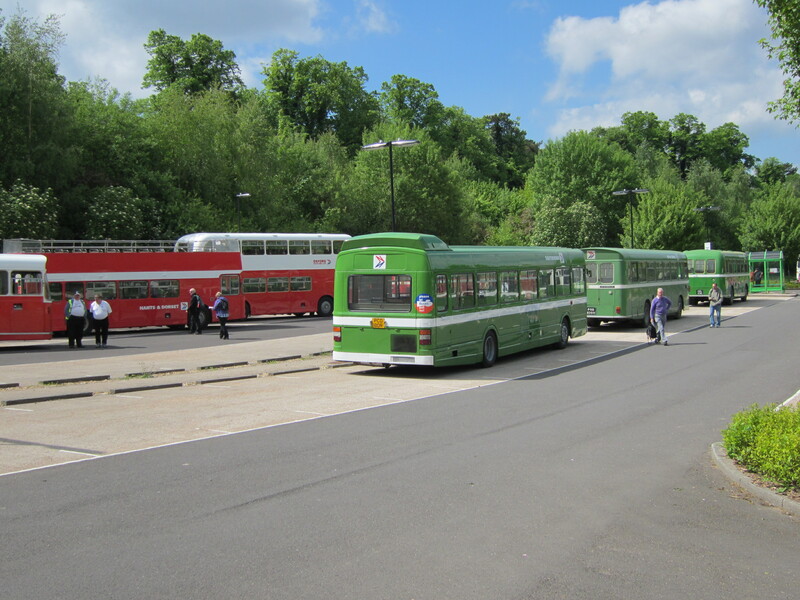 All of these were completed as days out from Crawley. 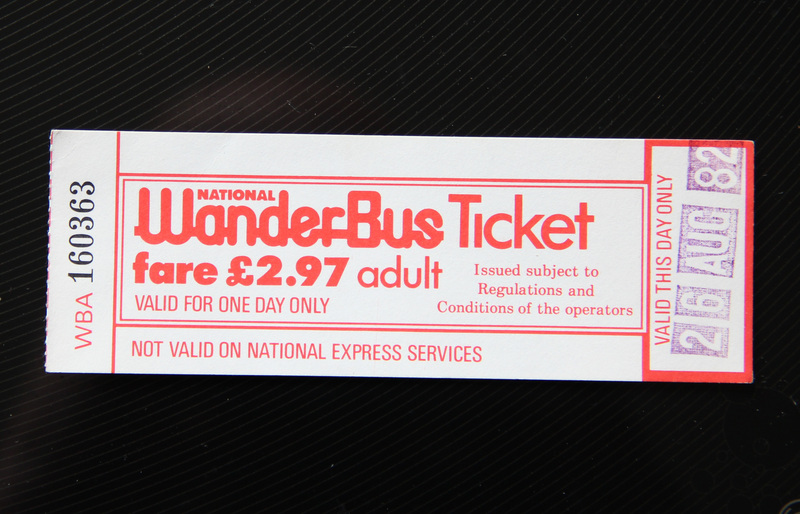 A ‘Wanderbus’ ticket from 2nd September 1981 purchased from Devon General in Paignton for a trip to Buckfastleigh then via Western National to Plymouth and in Cornwall at Saltash. 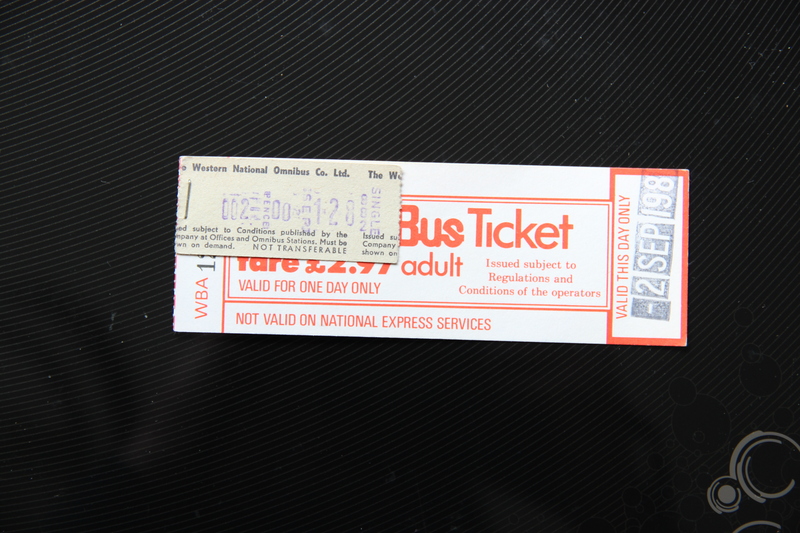 The attached ticket is where I had to pay for a 2p day return (even though it’s printed as ‘single’) as a 1p each-way supplementary fare to cover the Tamar Bridge tolls! 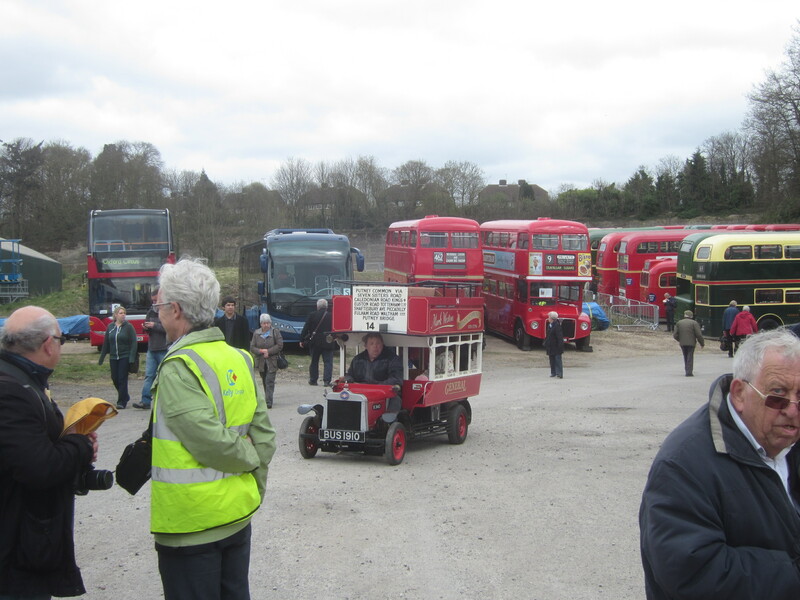 I shall be recounting some of my days out with a ‘National Wanderbus’ in future posts on this blog page. But I’d love to read about some of yours in our comments section below. 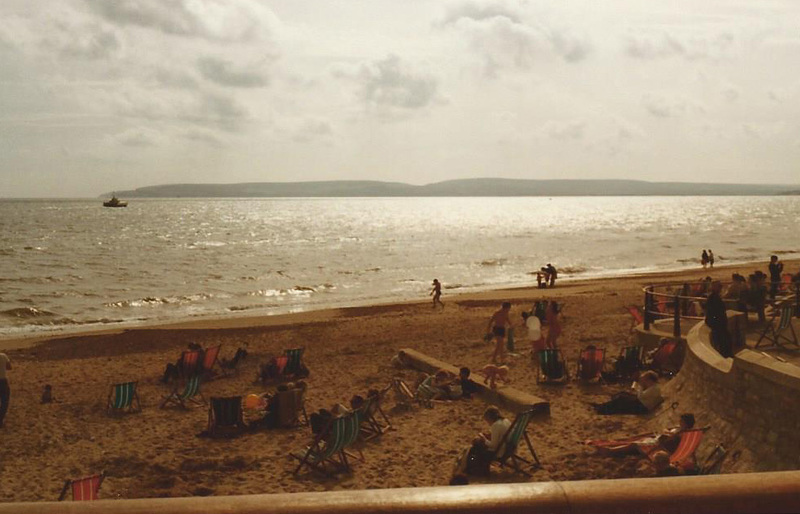 How far did you travel? Did you get to use any non-NBC services with your ticket? Did you have to pay any supplements such as mine for the Tamar Bridge? 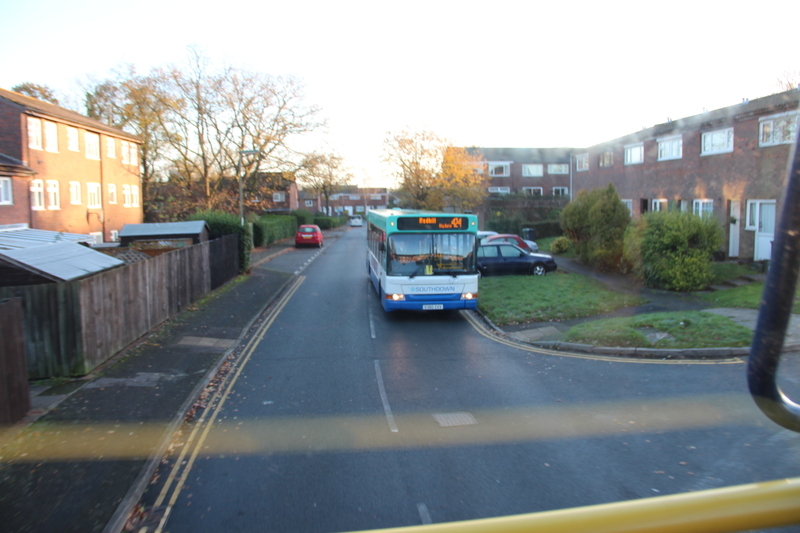 Did you get to ride on any of NBC’s fast disappearing blue buses? 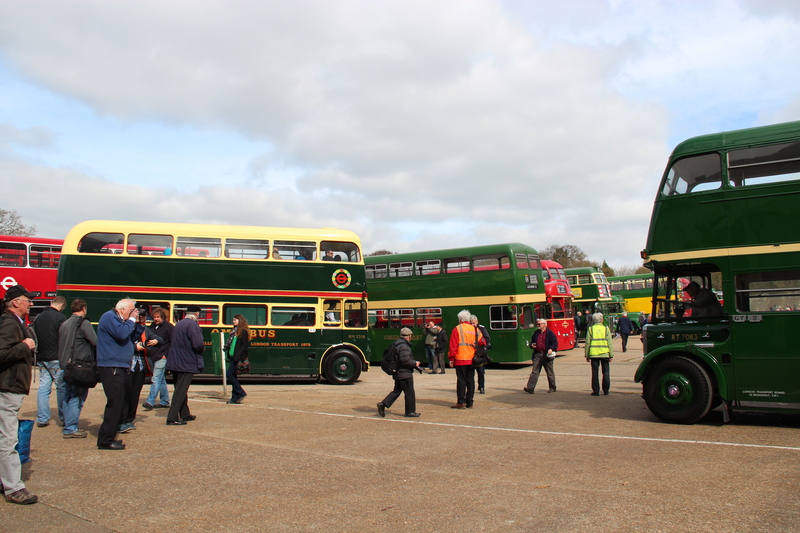 This years event celebrated the centenary of the EAST KENT ROAD CAR COMPANY Ltd with an impressive line up of preserved vehicles at the Detling Showground. 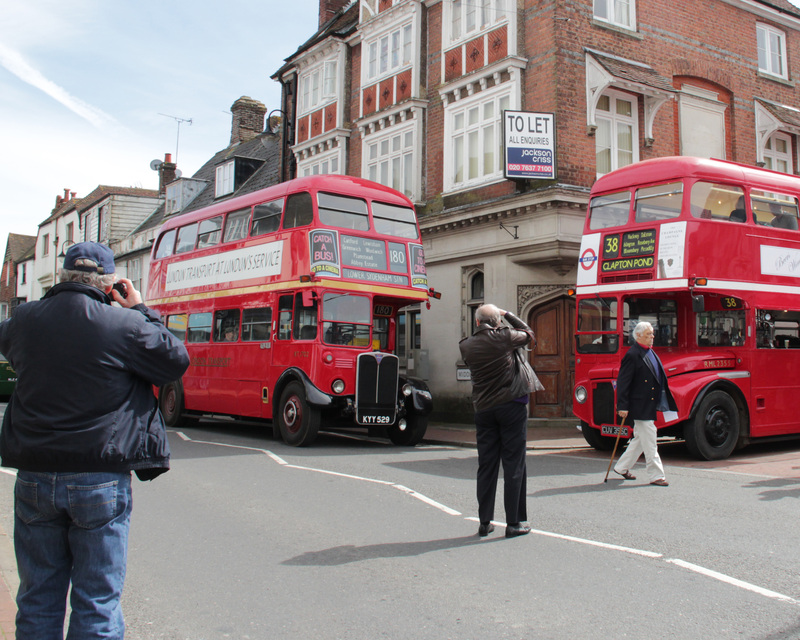 For decades their cherry red and cream vehicles were a familiar sight as they threaded their way through an area stretching from Faversham to Hastings and Maidstone to Dover. 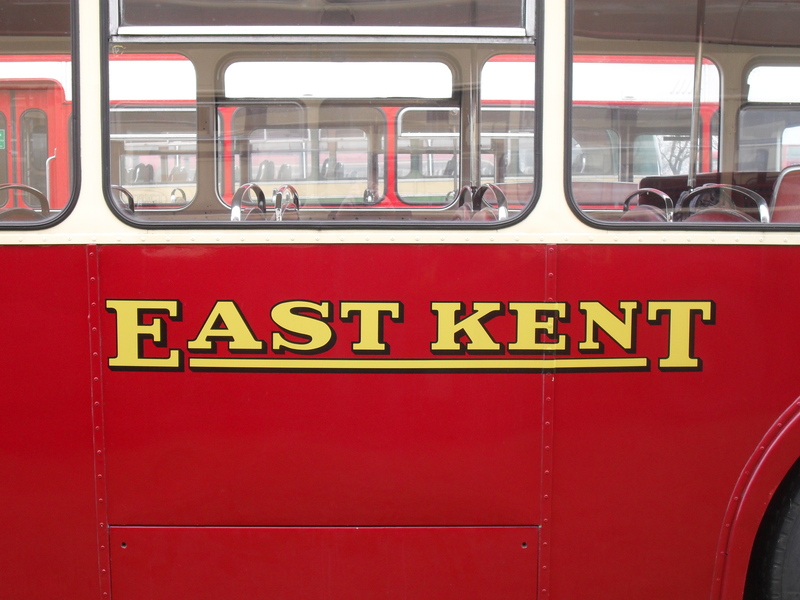 Being part of the British Electric Traction empire there was major co-operation and joint workings with their BET neighbours at MAIDSTONE AND DISTRICT with whom they shared common management shortly after nationalisation in 1969. 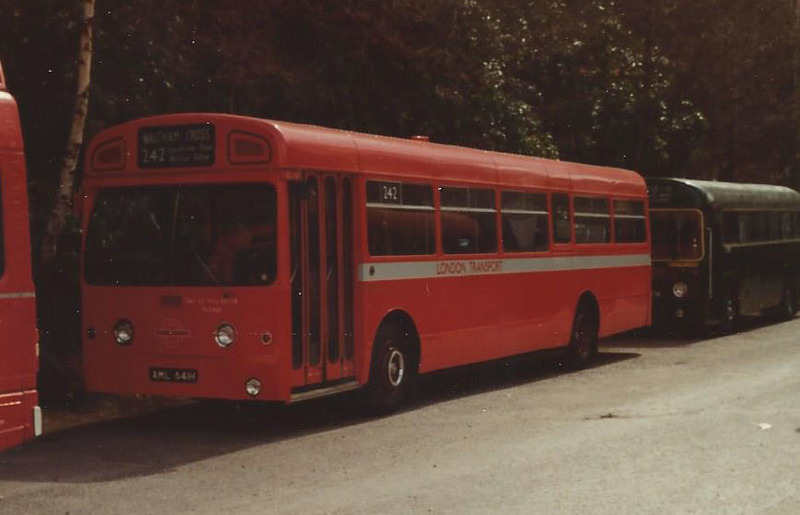 The NBC era saw the much loved cherry red and cream buses re-appearing in the corporate National Bus ‘poppy red’ livery from 1972 but the individuality of EAST KENT remained, not least with the fact that none of their vehicles carried fleet numbers until 1977, until then only being identified by their registration plates. 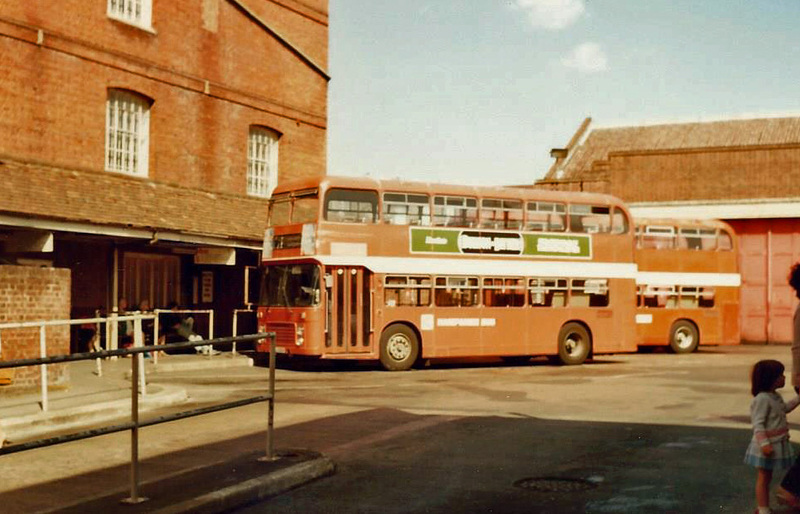 During this period there were several exchanges of services and vehicles between EAST KENT and M&D but thankfully the proposed complete merger and renaming of the two companies as NORTHDOWN was resisted. 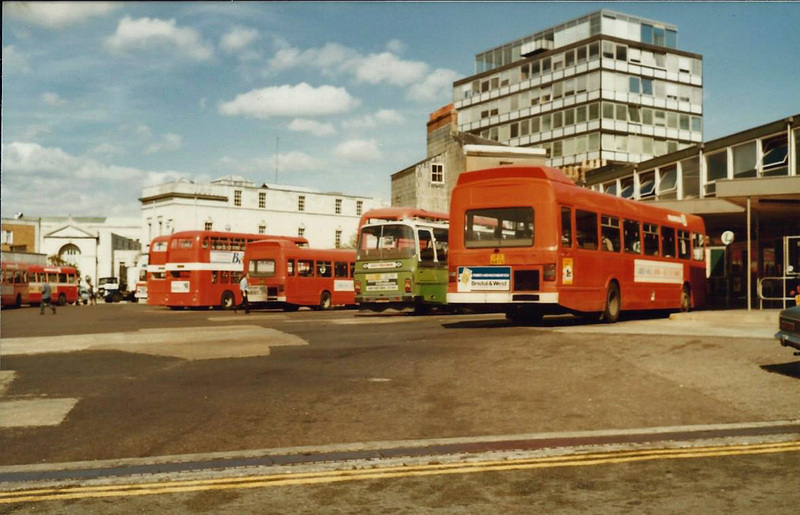 In fact the two companies gradually moved apart in the early 1980’s and then split formally in 1983 as a precursor to deregulation and privatisation, which happened in 1986 and 1987 respectfully, with a management buy-out of the company. 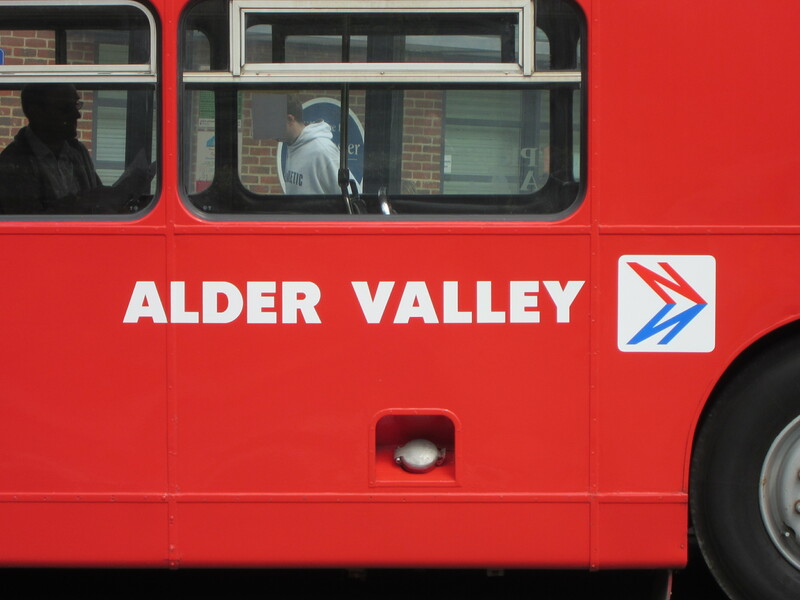 The cherry red and cream livery was reinstated in a revised style, but this was to be short lived as the company was acquired by STAGECOACH in 1993, bringing their corporate image to the buses of Kent. 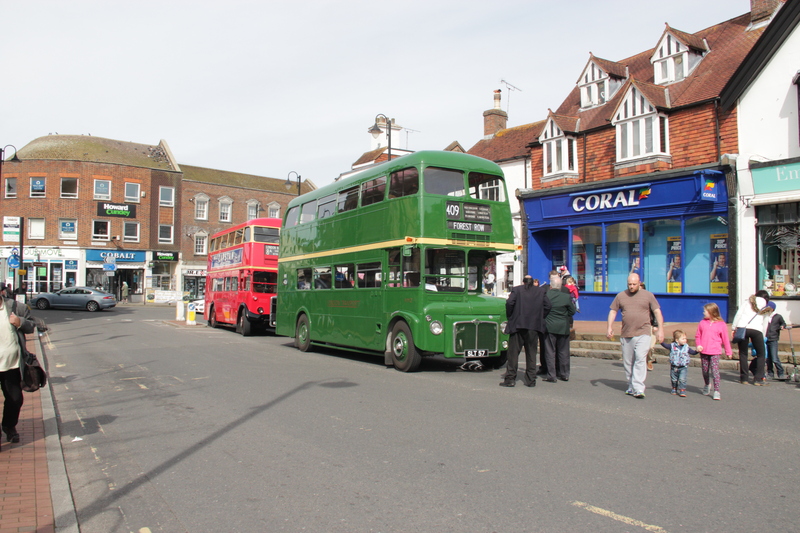 Ride with us on the 0800 departure of Metrobus route 460 from Crawley Bus Station to Reigate Station on 28th November 2015. 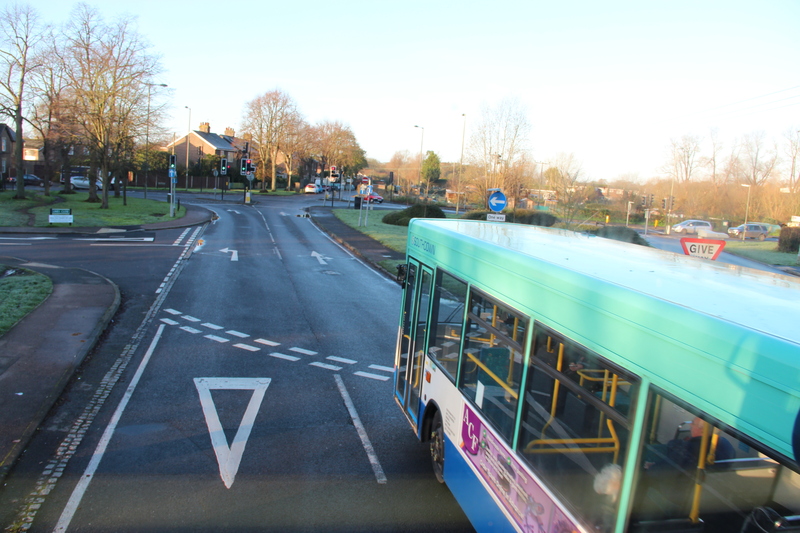 All the views are taken on the move from the top deck of a Scania Omni Decker, so expect some camera shake, reflections and dirt on the windows, but remember, this is the genuine bus ride! 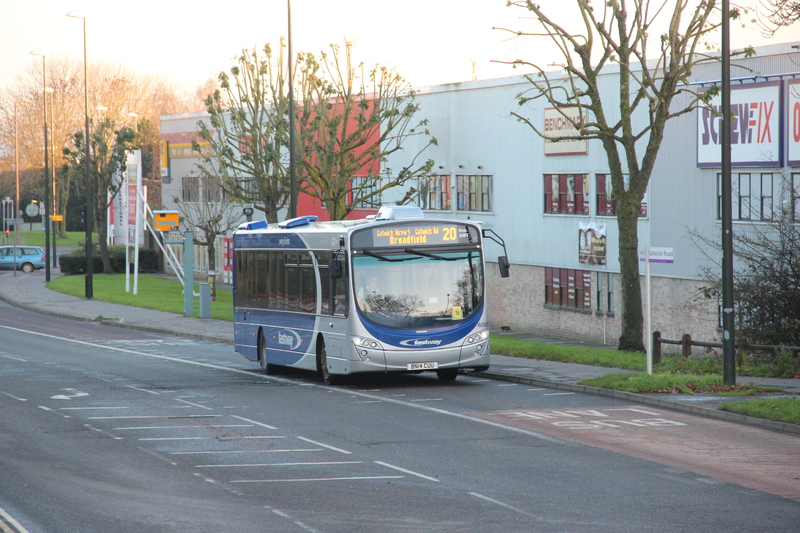 A short wheelbase Scania Omni-City pulls out from Metrobus’s Crawley depot in Tinsley Lane North ready to take up duty on the Fastway 100. 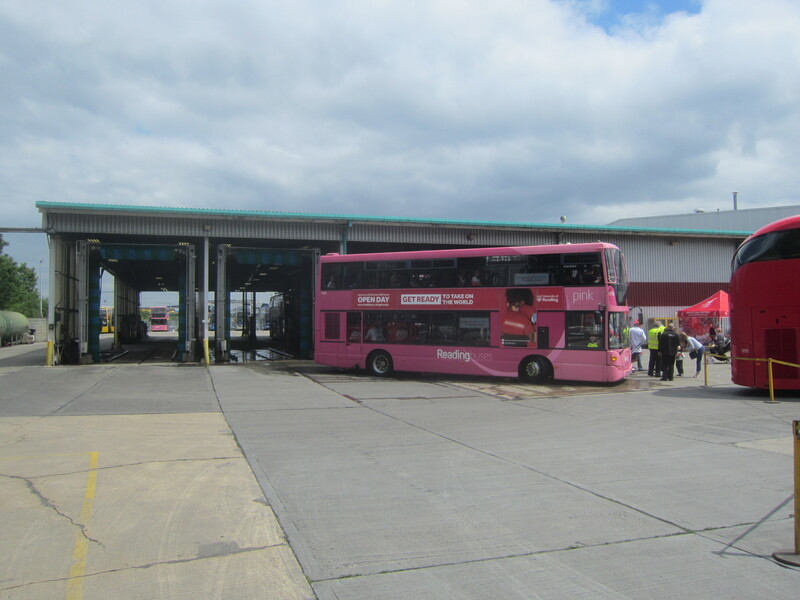 We’re waiting at the ‘depot’ stop at Gatwick Road North as an Enviro and a dual door long wheelbase Omni-City leave the depot to start their day. 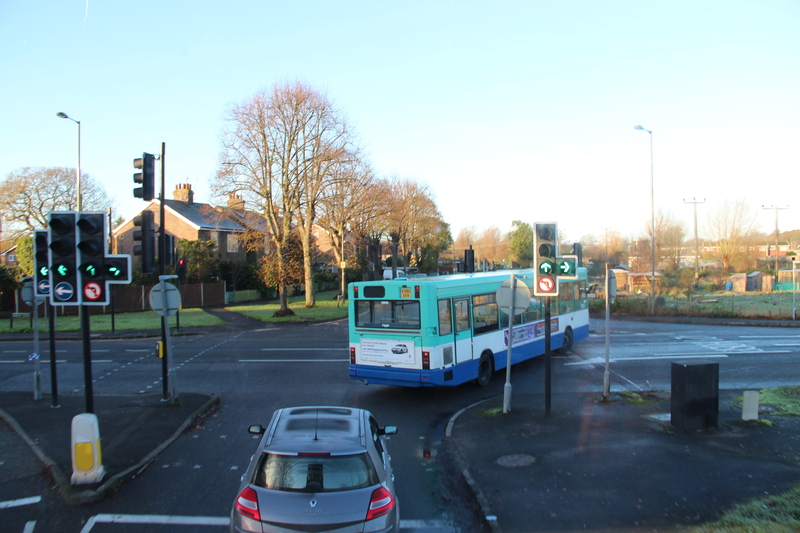 One of the second generation Fastway vehicles, a Wright-Volvo in the Gatwick Road bus lane on route 20 to Broadfield. 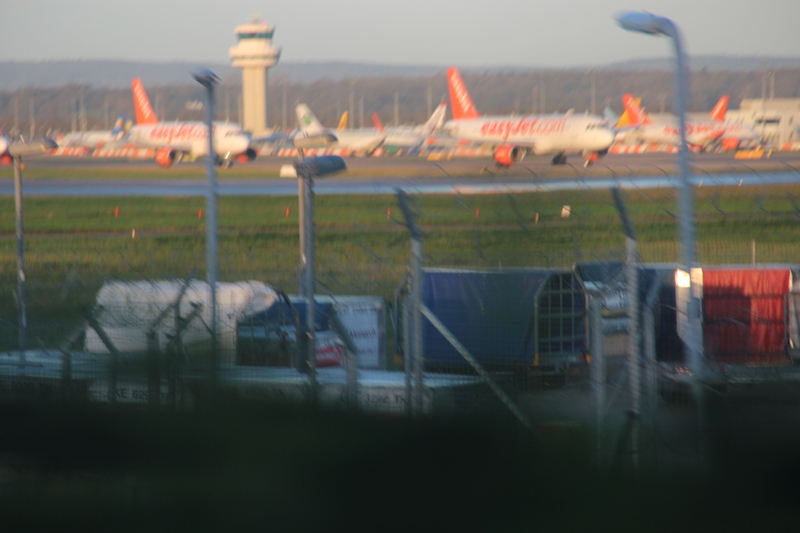 A Boeing 737 descends on to the Gatwick runway. 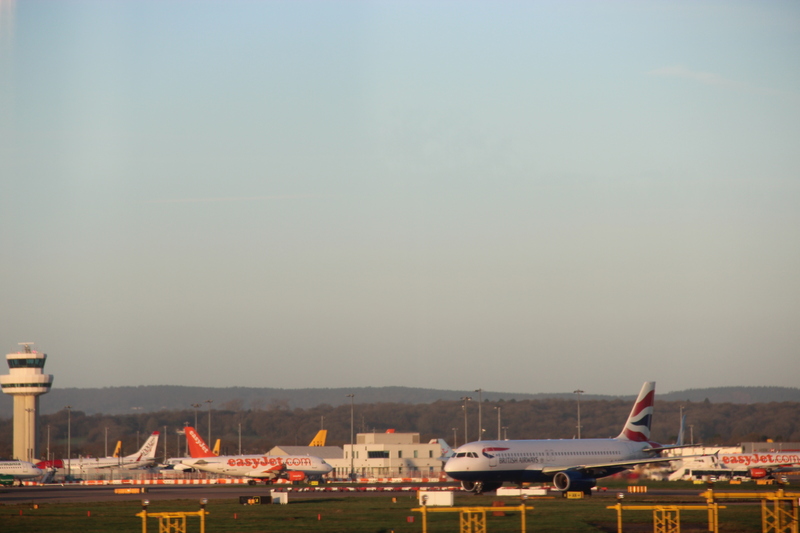 If the second runway is ever built, it will cut from left to right roughly where the roundabout is situated. 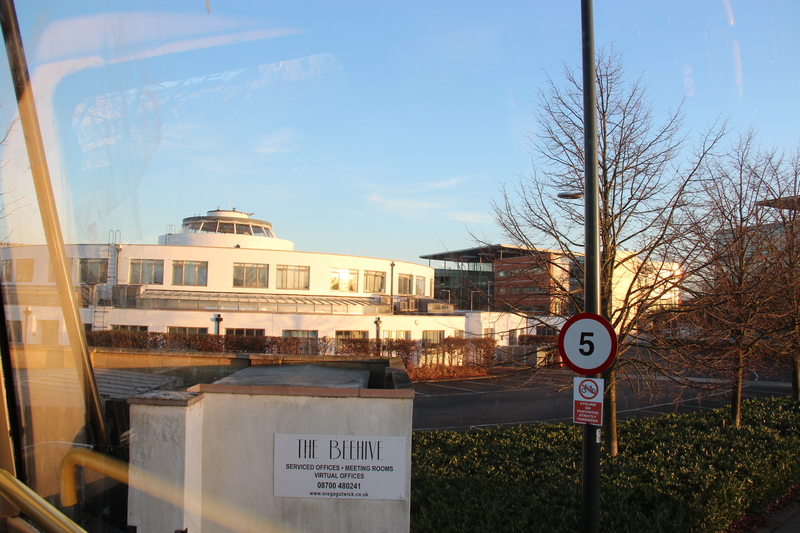 Gatwick’s original terminal from the 1930’s, ‘The Beehive’ to our right. 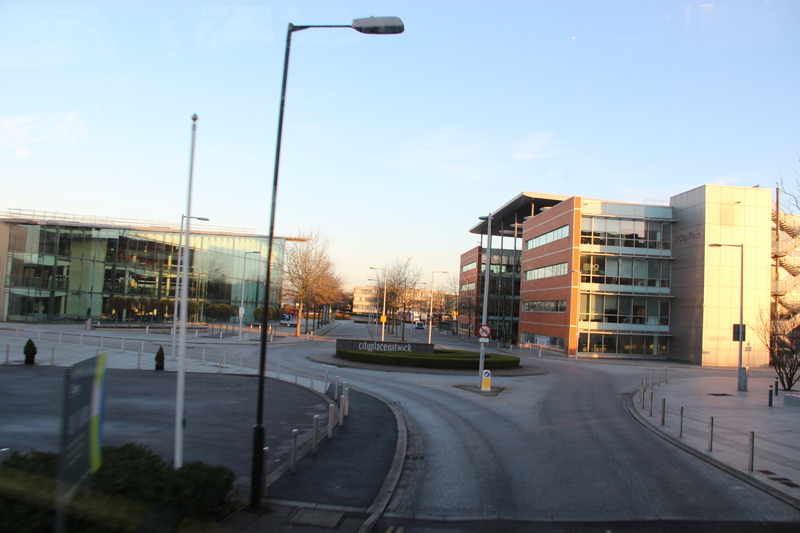 Having left the Gatwick Road and turned by The Beehive we now find ourselves in City Place, a small business park on the site of the first Gatwick Airport. 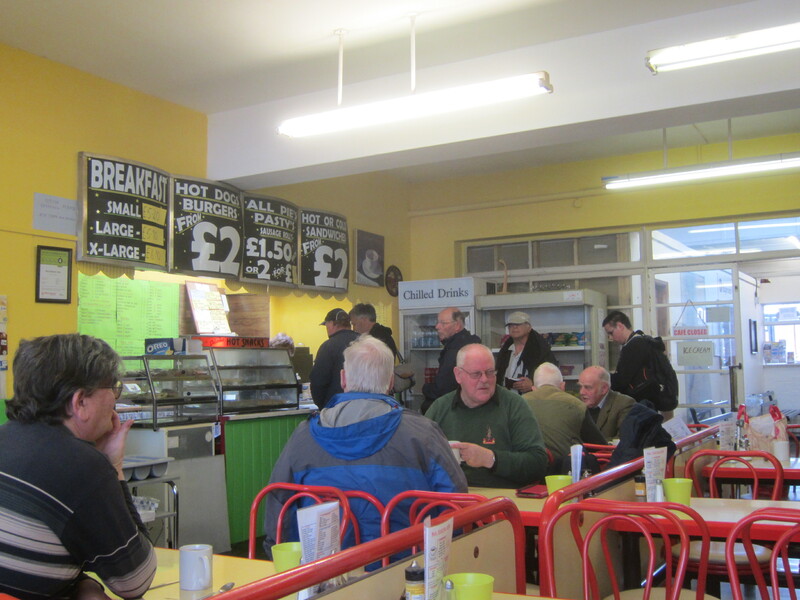 It was on this piece of ground that The Beatles filmed a couple of sequences for ‘A Hard Day’s Night’ in 1964. 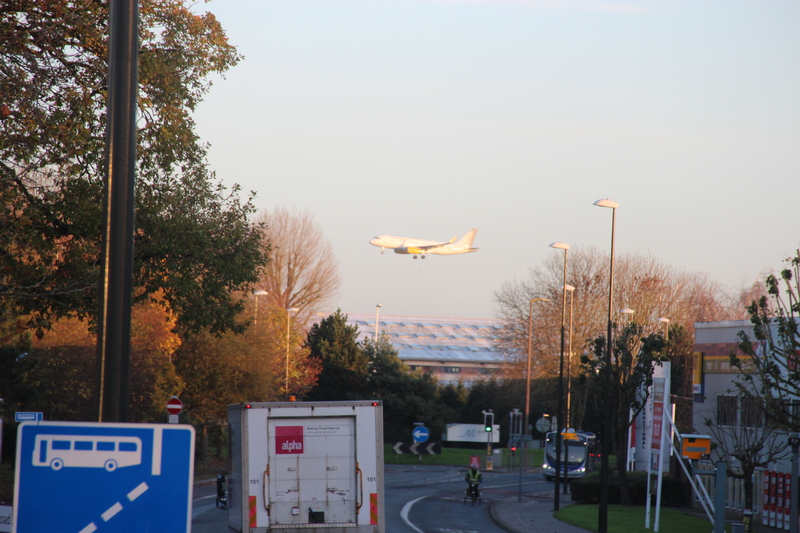 Out on the main A23 dual carriageway now and the top deck of a bus provides splendid views over the fence into the airport, something you just don’t get from a car! There’s always something interesting to look at! 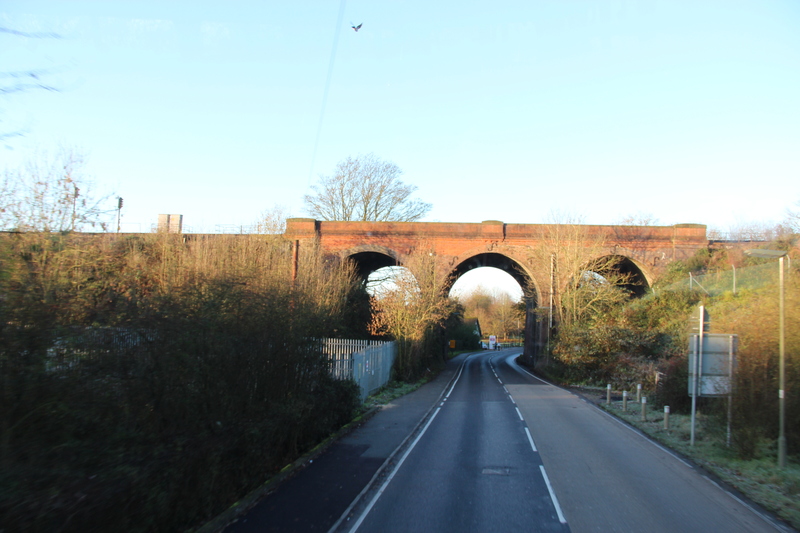 Similar views are available from the railway line but it’s frequently obscured by trains berthed in the sidings. 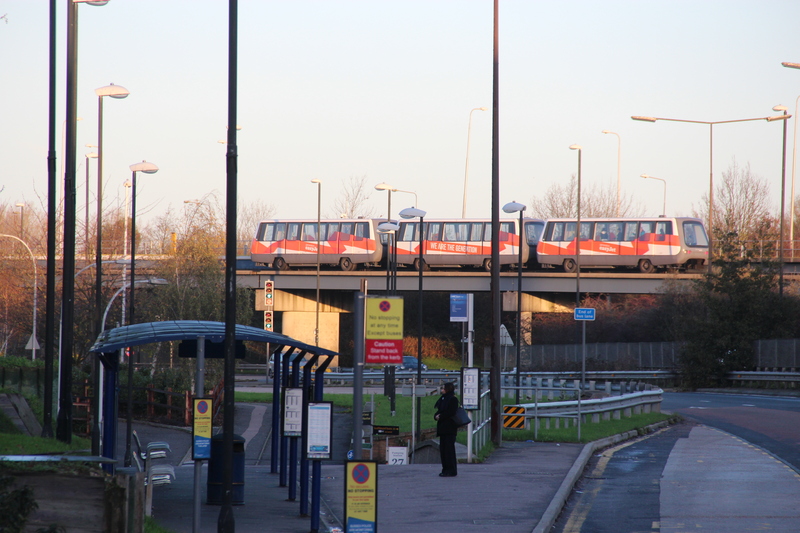 The Inter-Terminal Shuttle crosses the A23 close to the South Terminal bus stop. 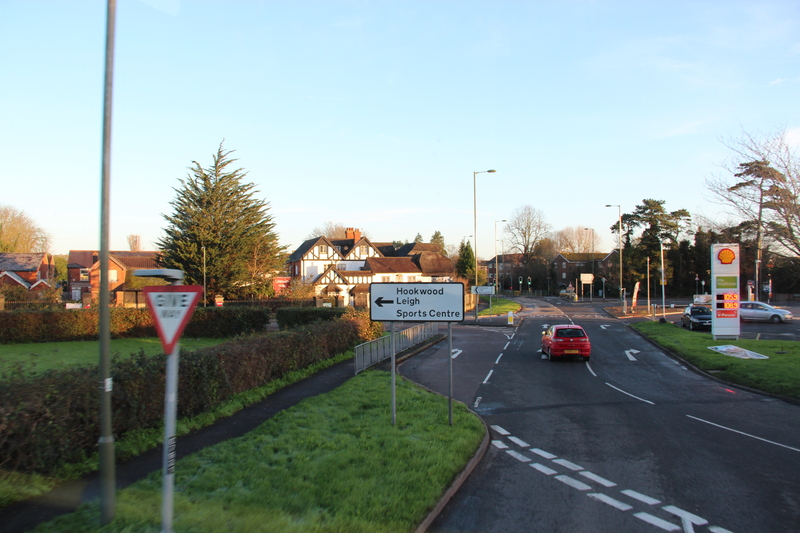 Approaching the Longbridge Roundabout on the Surrey border where we will turn right to follow the A23. 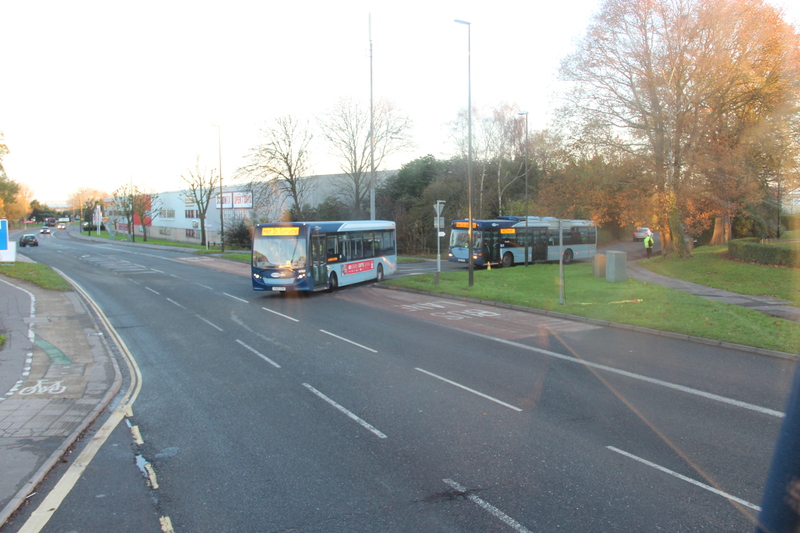 A Scania Omni-City leaves the roundabout for Povey Cross on Fastway 100. 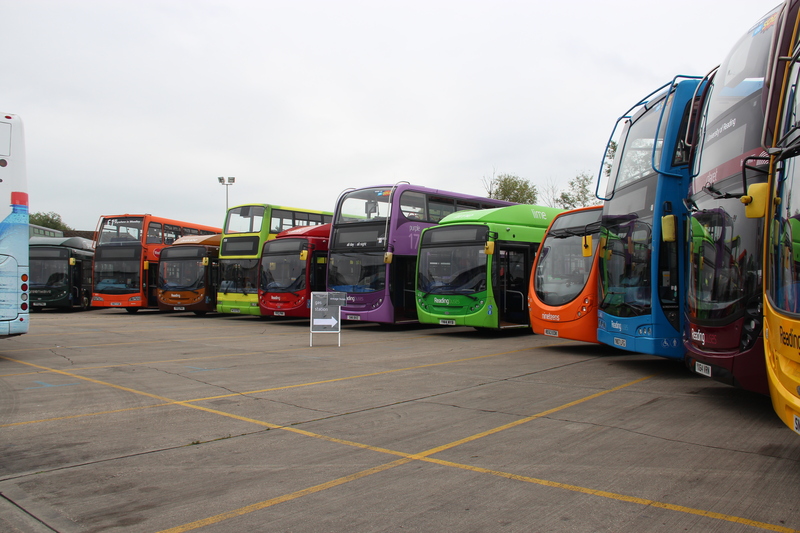 The short wheelbase Scanias provided for the 100 are unique as they are not fitted with the guidewheels found on other Fastway vehicles. 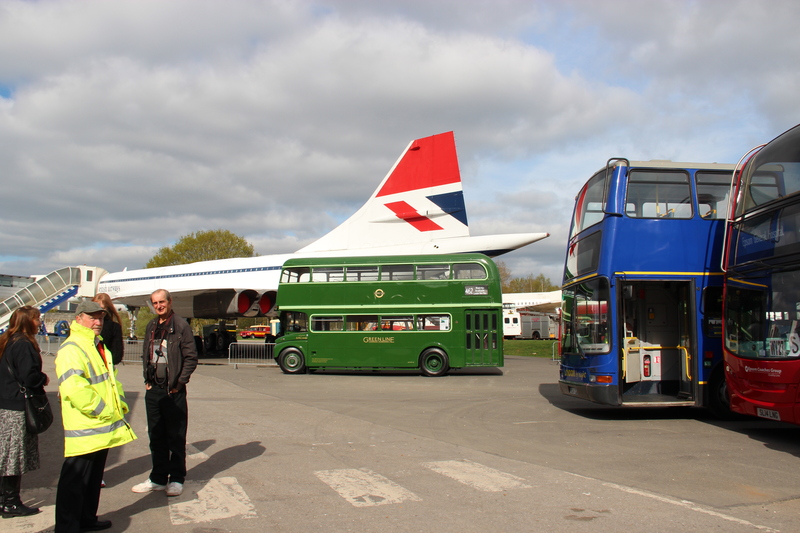 The 100 is not required to use the guideways. 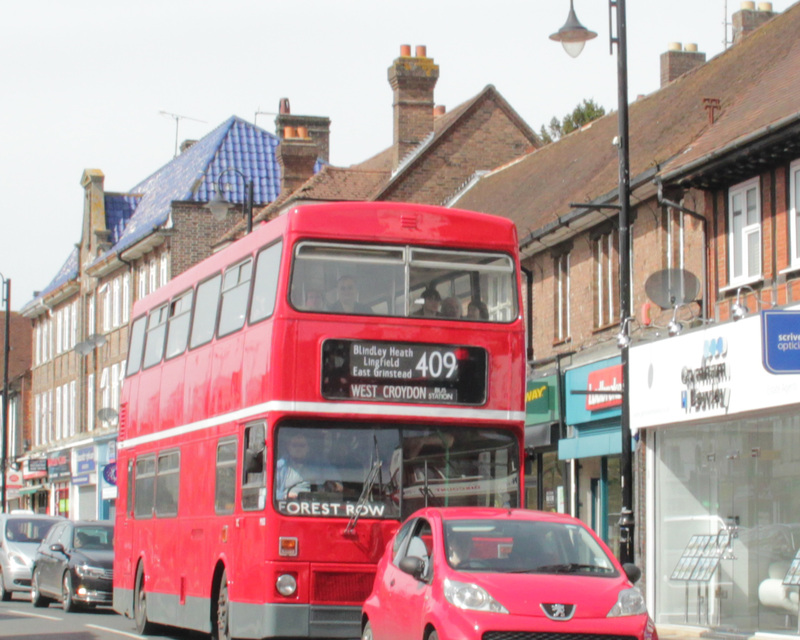 We’ve caught up with another Omni-City on the 100, re-furbished with the new Fastway decals and bound for Redhill as it turns into Horley along Massetts Road. 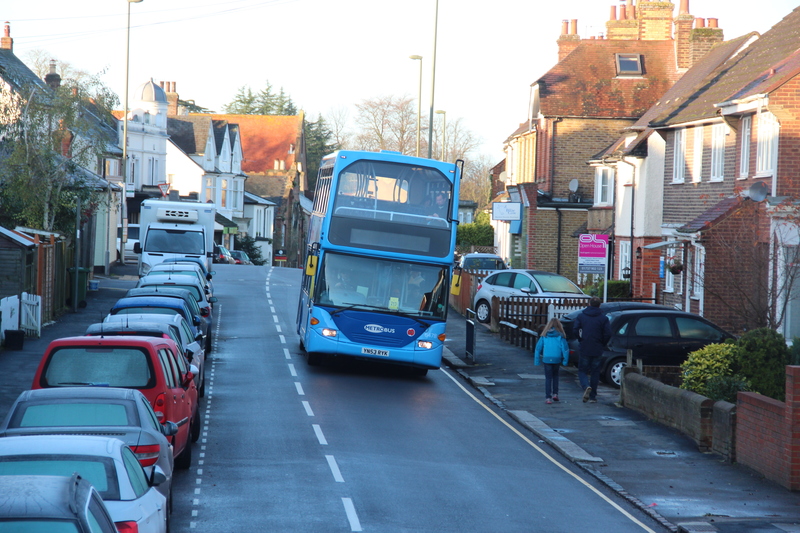 Our 460 will take the direct route ahead along the A23. 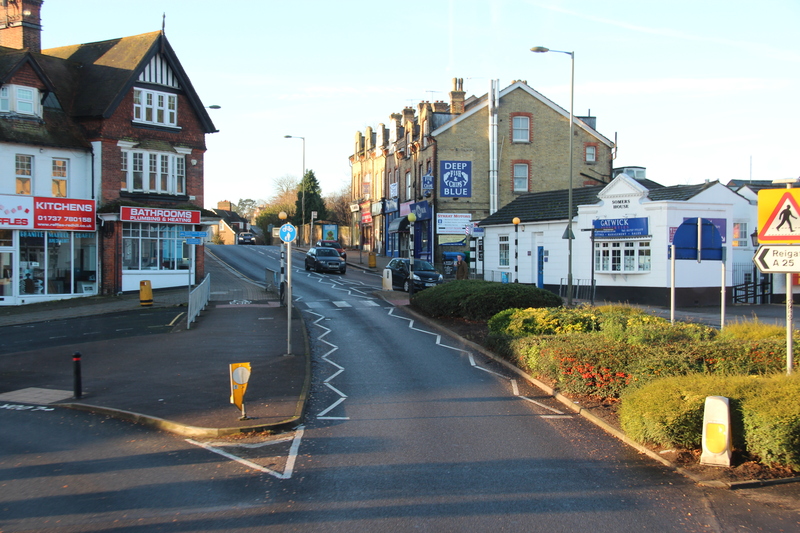 Horley, the Traffic Lights at a cross roads junction along side The Air Balloon pub, although us older patrons will remember it as The Game Bird or (even further back) The Thorns. 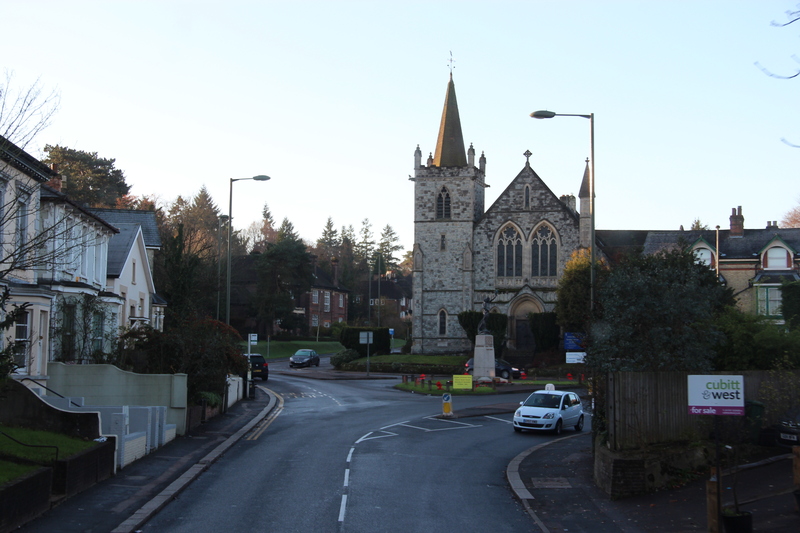 Still in Horley, now approaching The Chequers roundabout, named after a hotel (since closed) hidden just behind the direction sign. 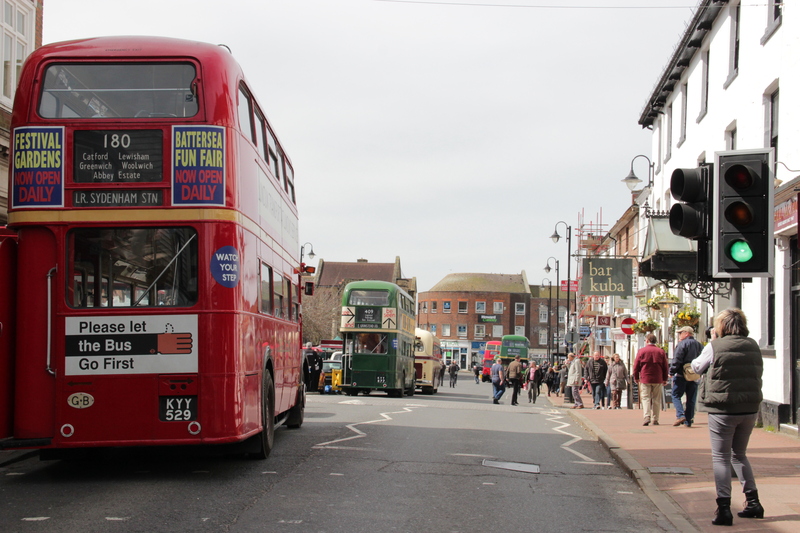 Our bus will follow the A23 straight ahead. 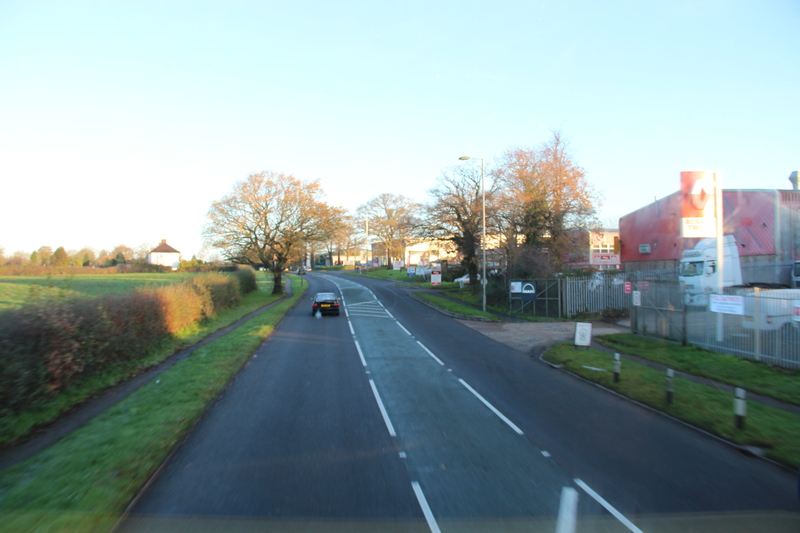 Industrial units on the A23 between Horley and Salfords. 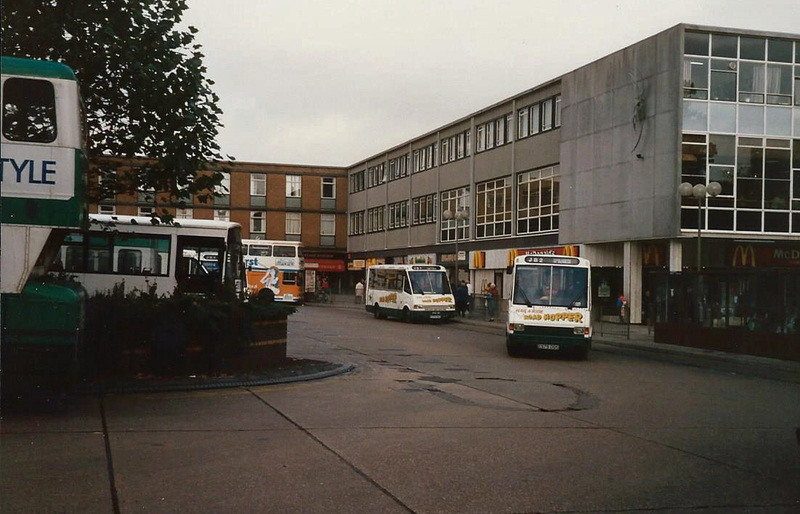 The shopping parade at Salfords village centre. 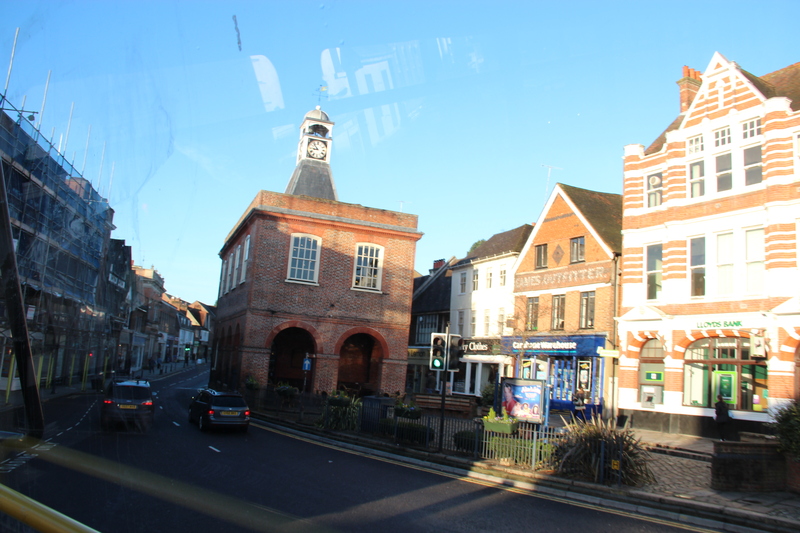 It’s beginning to look a lot like Surrey now, in fact things start to take on a real suburban appearance with very little in the way of true open countryside as we creep closer towards London. 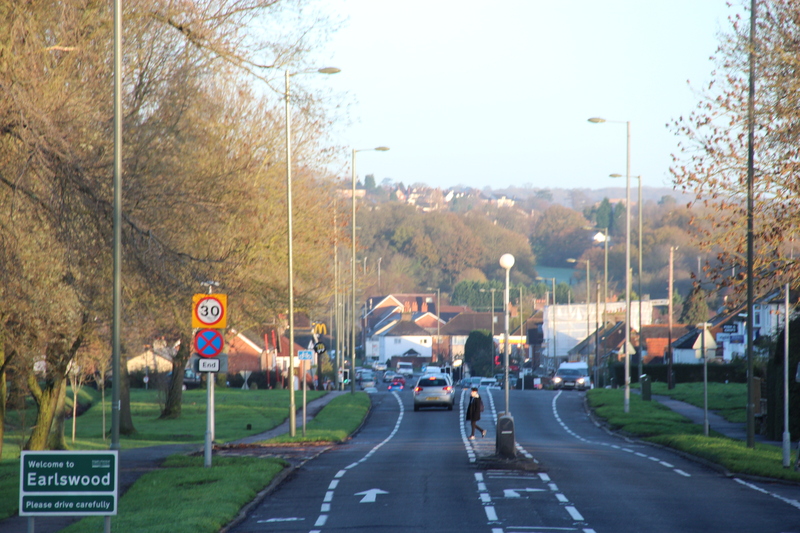 Over the hill from Salfords and we’re approaching Earlswood. 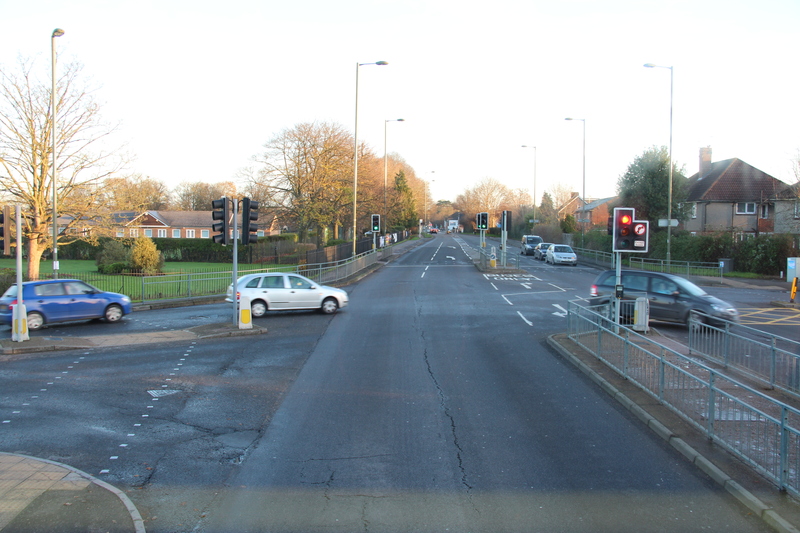 We’re about to leave the main A23, turning right at the traffic lights for a ‘double run’ to the Whitebushes estate and East Surrey Hospital. 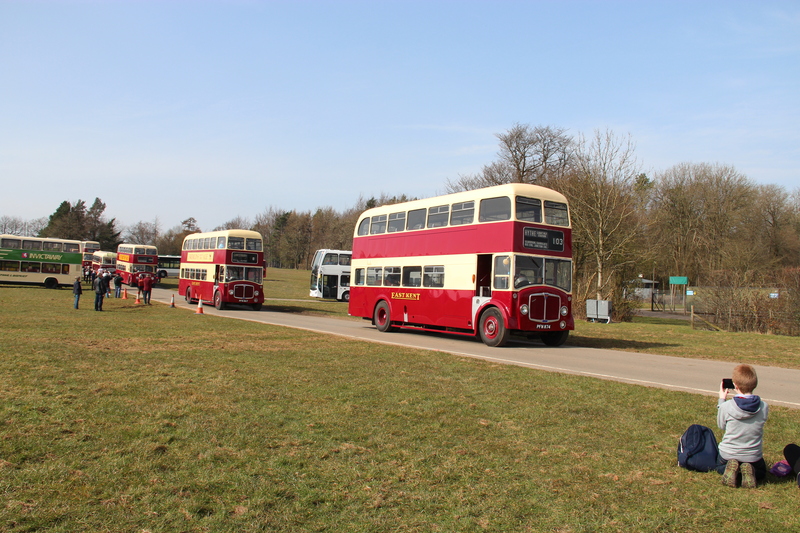 In the Whitebusehes estate we meet a Dart of Souhdown PSV on the 424, also running from Crawley to Reigate and Redhill but taking a less direct route via Copthorne, Smallfield and Woodhatch, a pleasantly scenic alternative route. 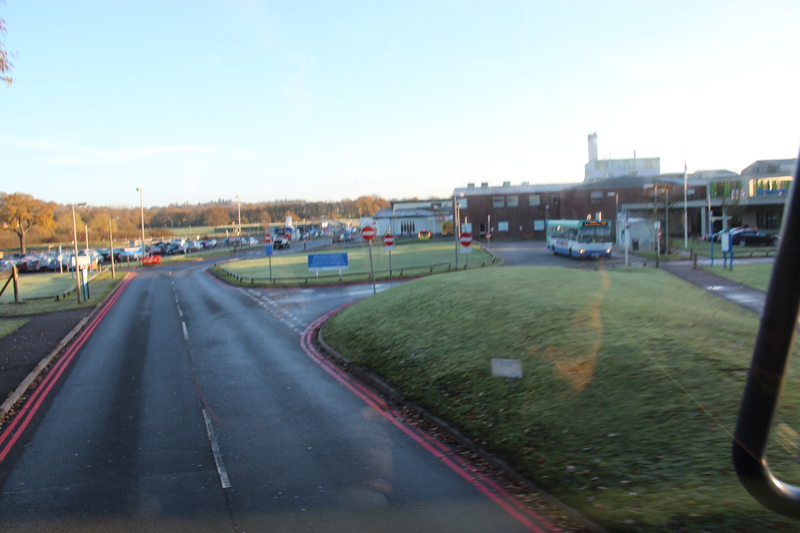 Having done the circle of Whitebushes we’re now approaching East Surrey Hospital where the 424 has crept ahead of us and is ready to depart. 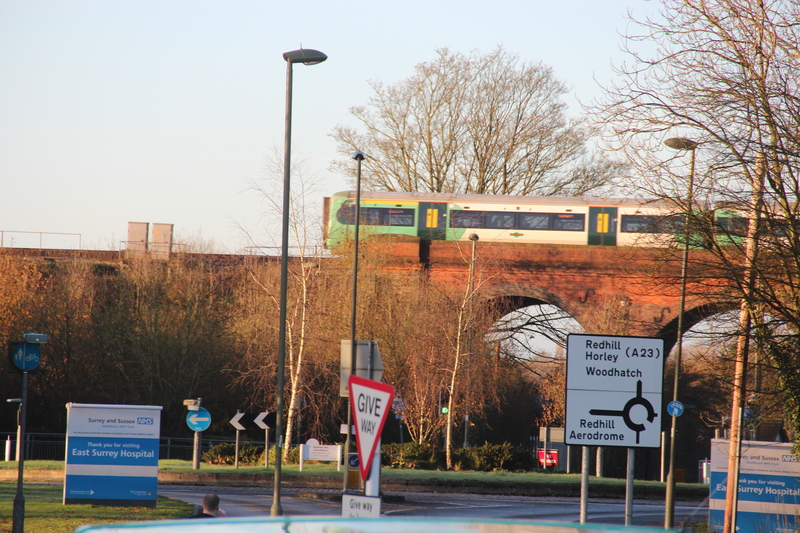 A Southern Railways Electrostar speeds southbound on the Brighton line as we leave the grounds of East Surrey Hospital. 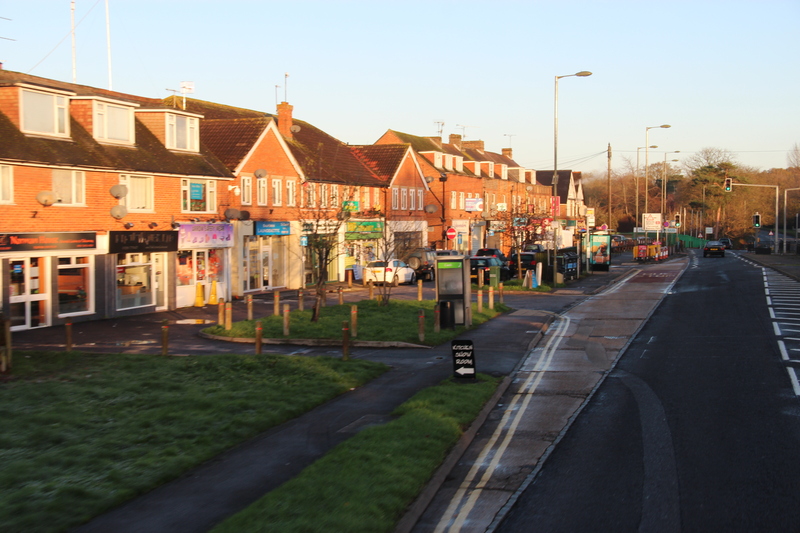 After many months of meetings, discussions, surveys and consultations, the town planners at Surrey County Council decided to name this street ‘Three Arch Road’. 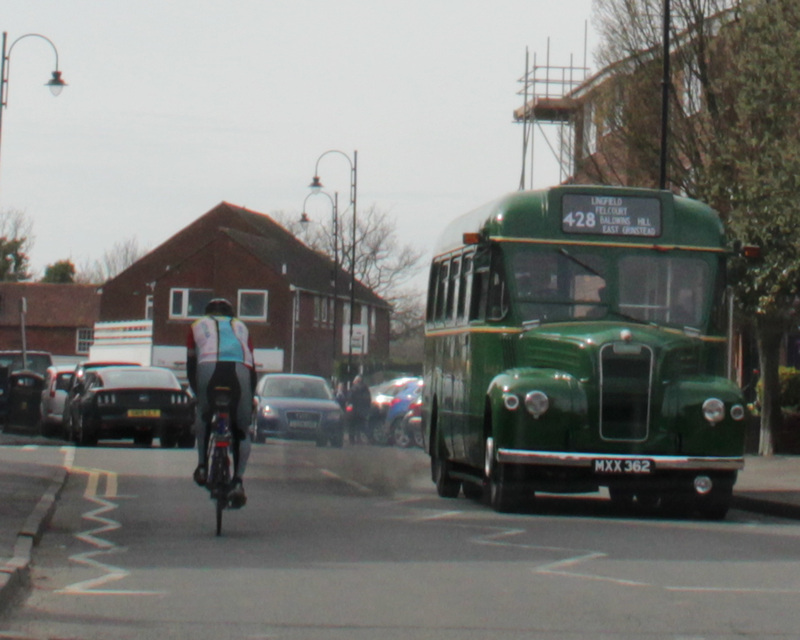 Nearly at the end of the hospital ‘double run’, about to re-join the A23 where we left it, as you can see the 424 has crept in front of us. 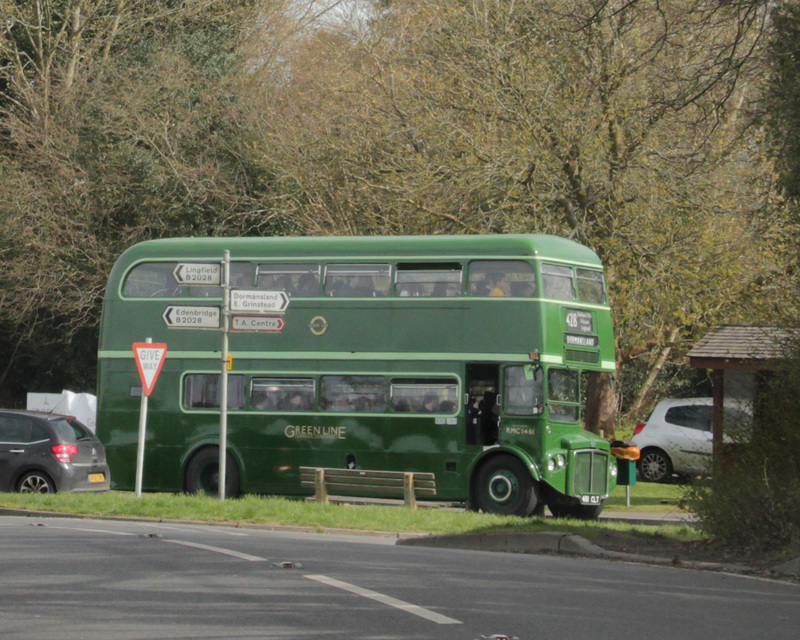 We both turn right to resume our northbound journey on the A23. 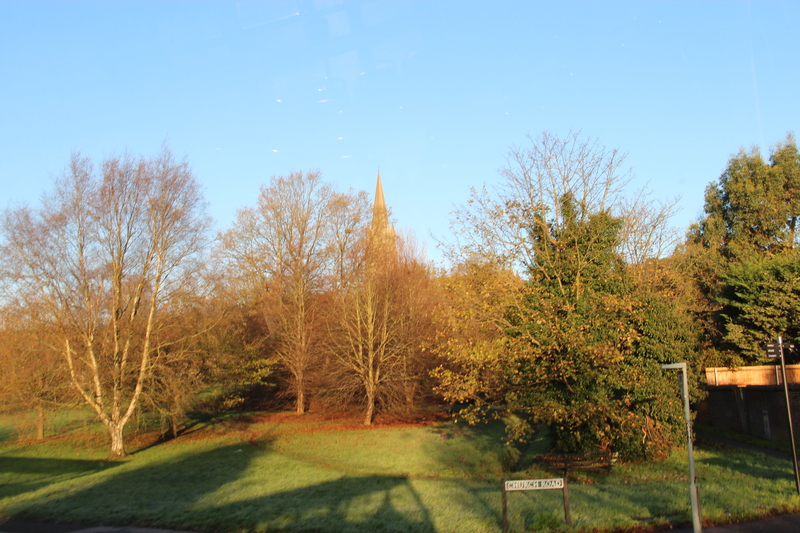 The spire of St John’s church is glimpsed through the trees as the bus casts a shadow over Earlswood common (and our photographer makes a cameo appearance). 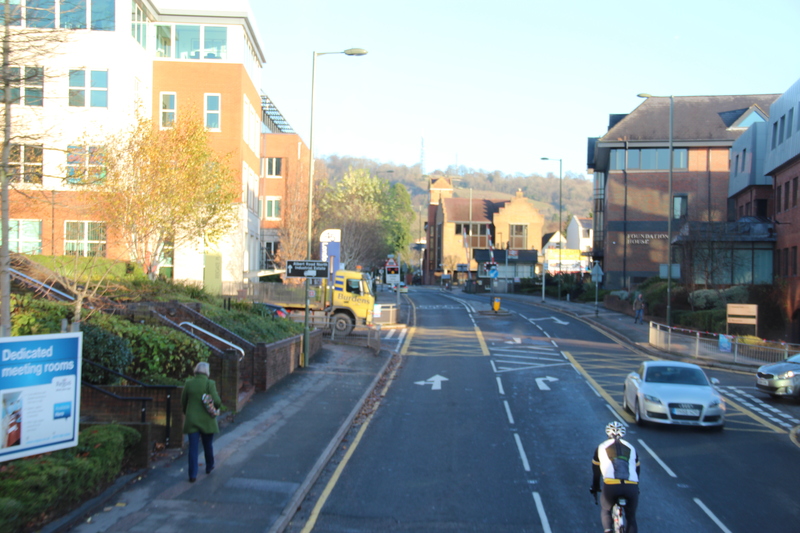 The long descent into Redhill from Earlswood. 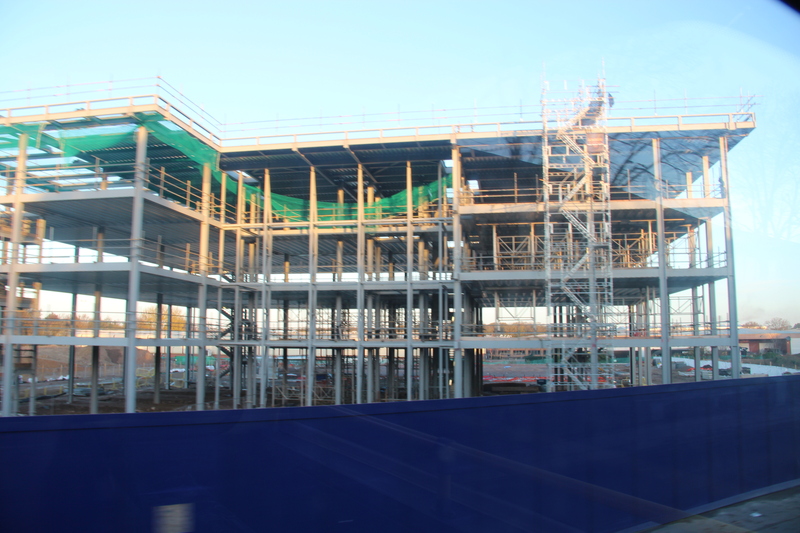 Almost alongside Redhill station now, this is the frontage of the old Odeon cinema as viewed from the inside. 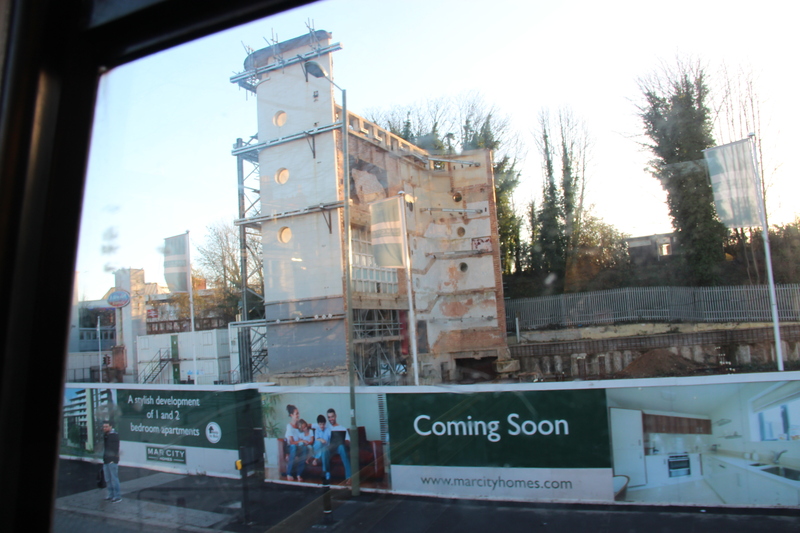 The cinema was demolished to make way for flats but the classic frontage was preserved to be ‘stapled’ on to the new development. 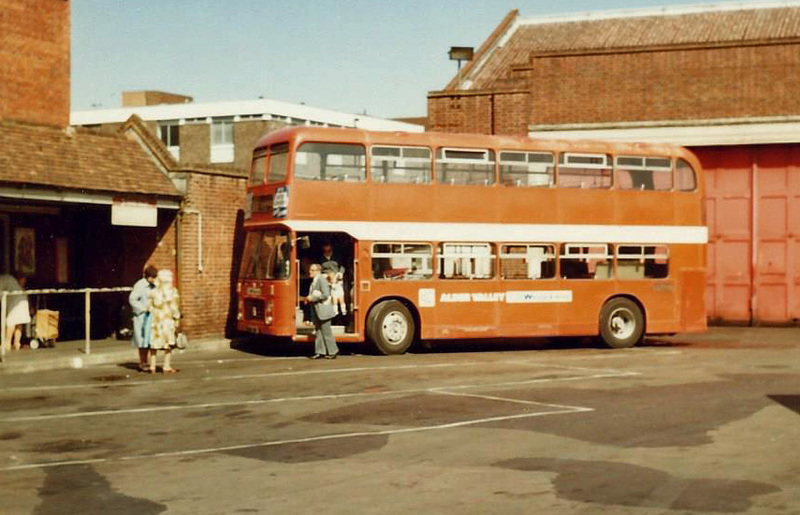 We’re followed into Redhill Bus Station by a red Metrobus Omni-Decker on TFL service 405. 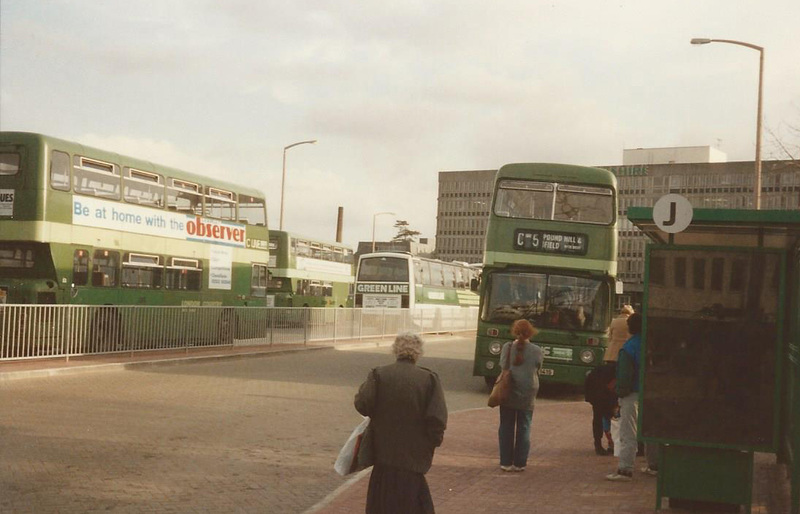 Now of course, for us older bus fans the 405 should really be green but such is…… The frontage of the Odeon cinema can be seen behind the bus. 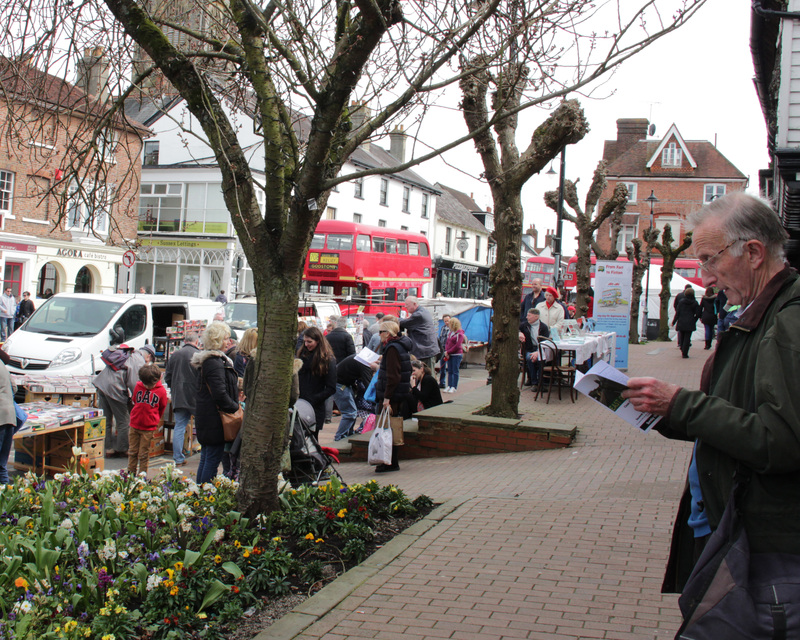 Now making our way through Redhill town centre as the shopping area gradually comes alive for the day. 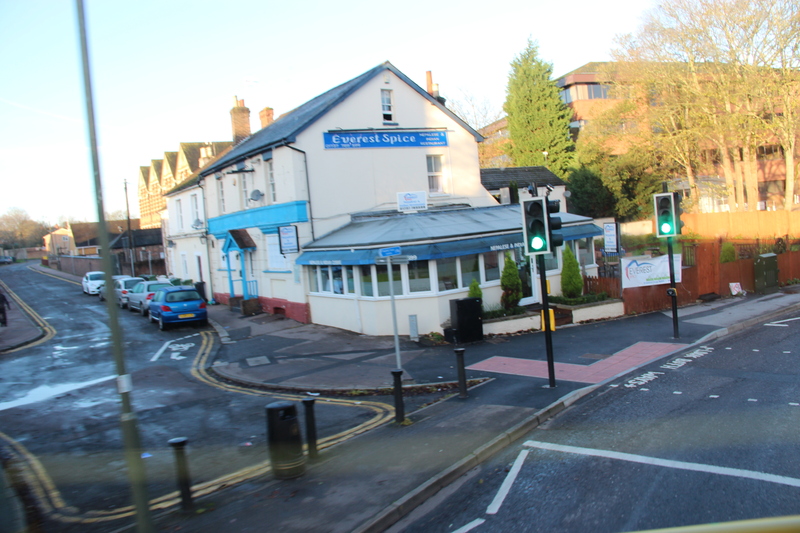 Round behind ‘The Belfry’, was once a pub, now a curry house. 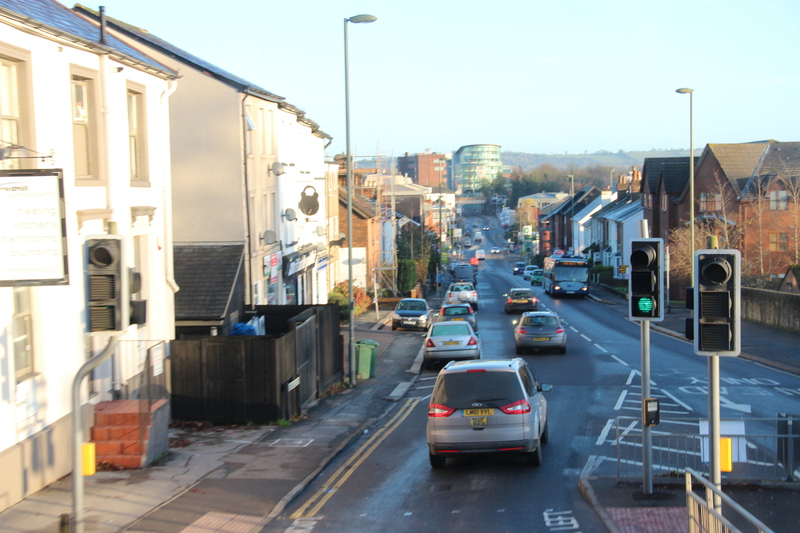 We’ve now turned left onto the main A25 east-west trunk route heading towards Reigate. 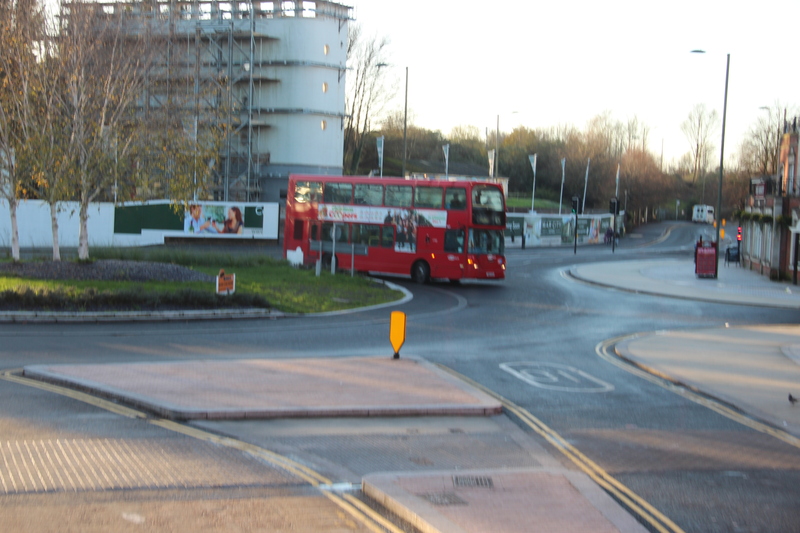 Crossing the roundabout by the Red Lion pub and Donyngs Leisure Centre, we follow the road ahead over the bridge crossing the Redhill-Reading line. 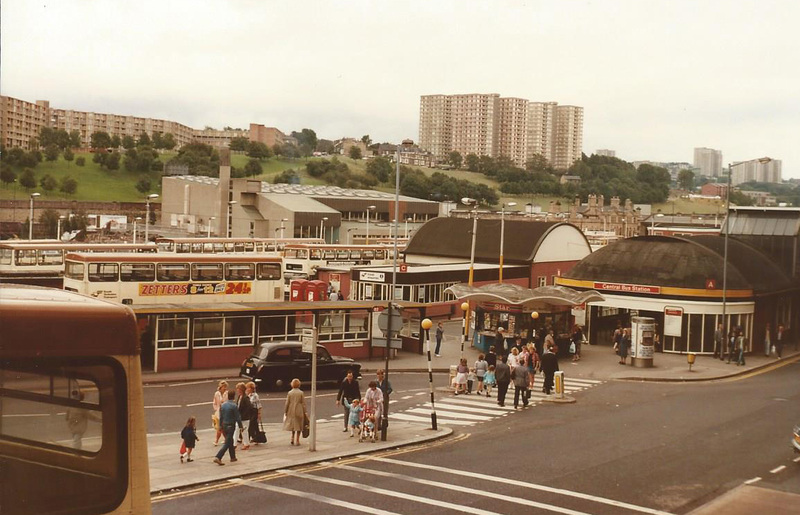 Shaws Corner. 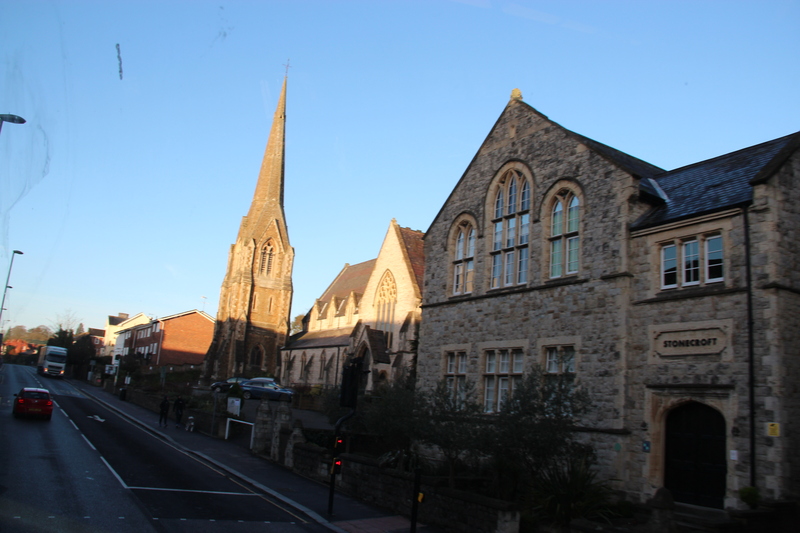 Our bus will turn left by the church along Blackborough Road, the A25 curving off to the right. 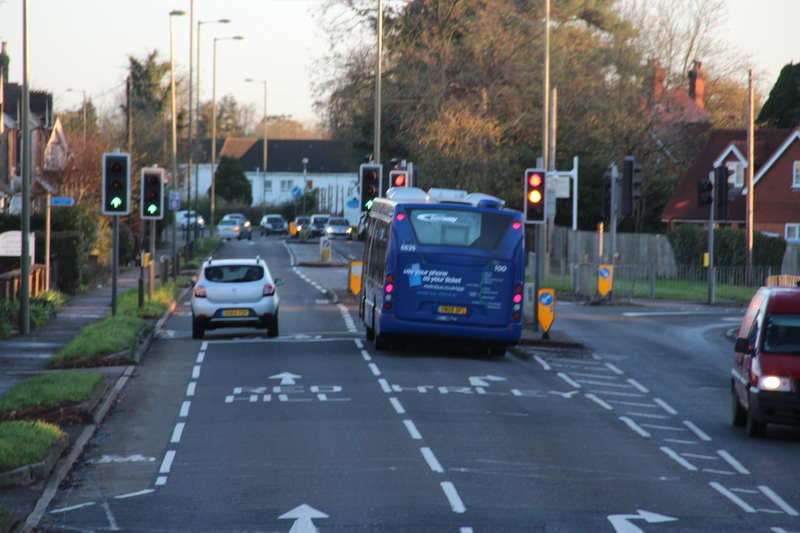 An oncoming Omni-Decker in the new Metrobus livery finds just enough room to squeeze past us. 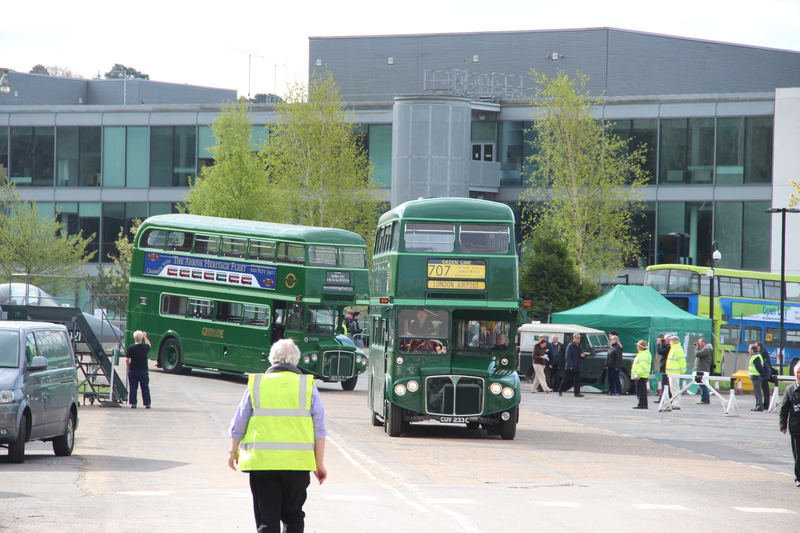 Blackborough Road becomes Lesbourne Road, home to the old London Transport Reigate bus garage, the frontage of which has been preserved while the original shed has been demolished and replaced by a new office development, appropriately called ‘Omnibus’. 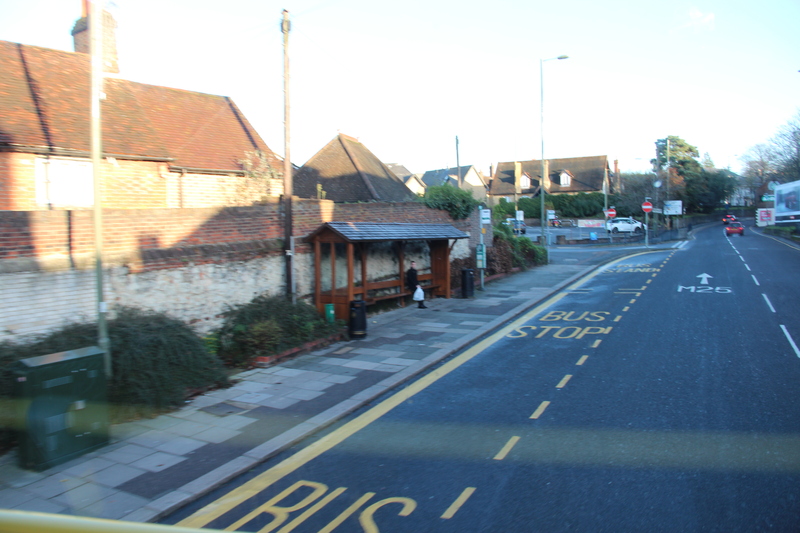 Happily, the bus stop at this location bears the title ‘Old Bus Garage’. 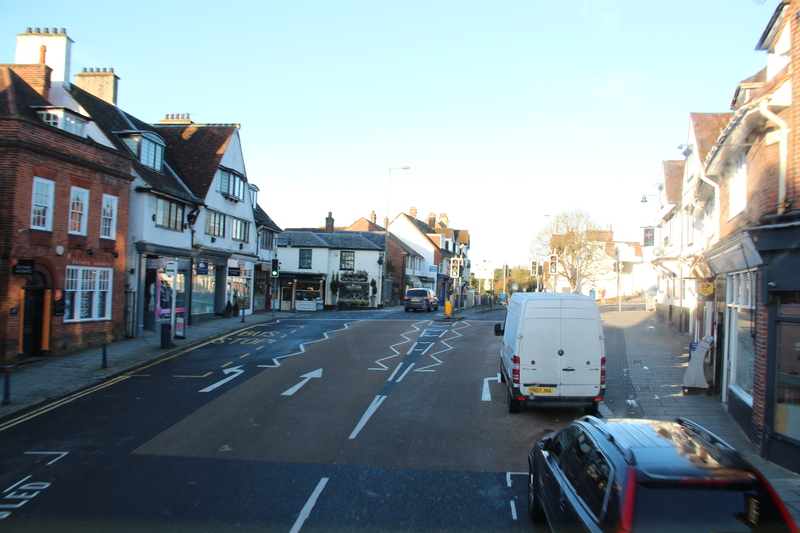 We’ve turned right from Lesbourne Road into Bell Street heading up towards Reigate town centre. 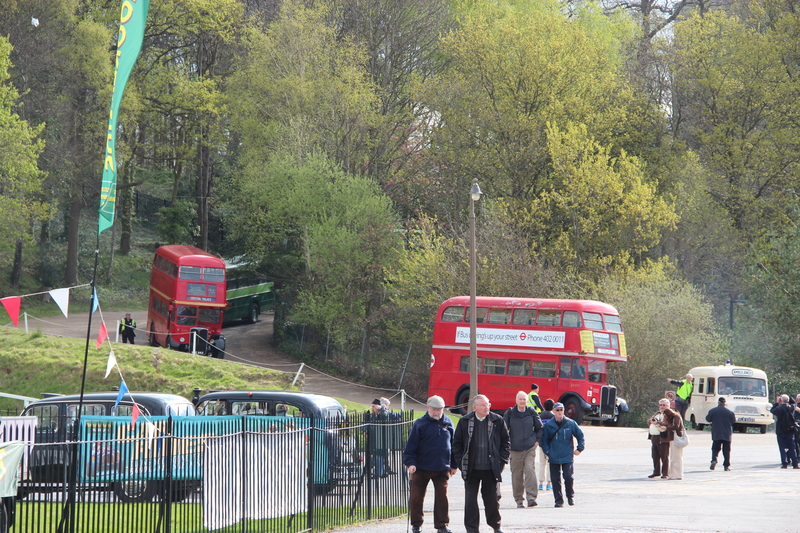 On our left behind the buildings is Reigate Priory Park. 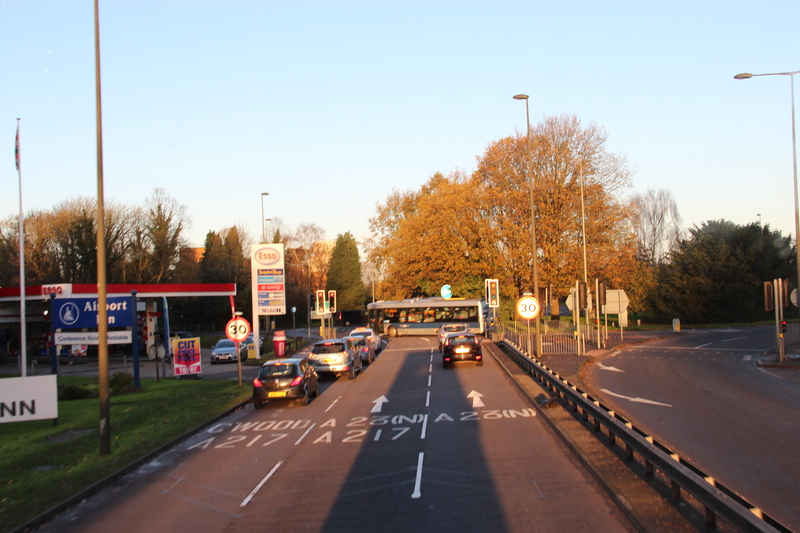 The gap between the white buildings in the distance is the original course of the A217 London Road which passed through a tunnel under the castle grounds at this point. 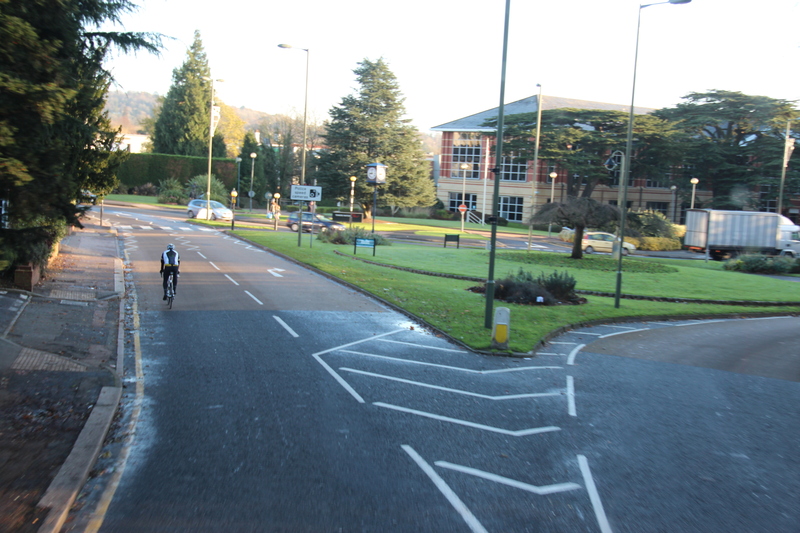 Today, all traffic follows a one way system around the hill. 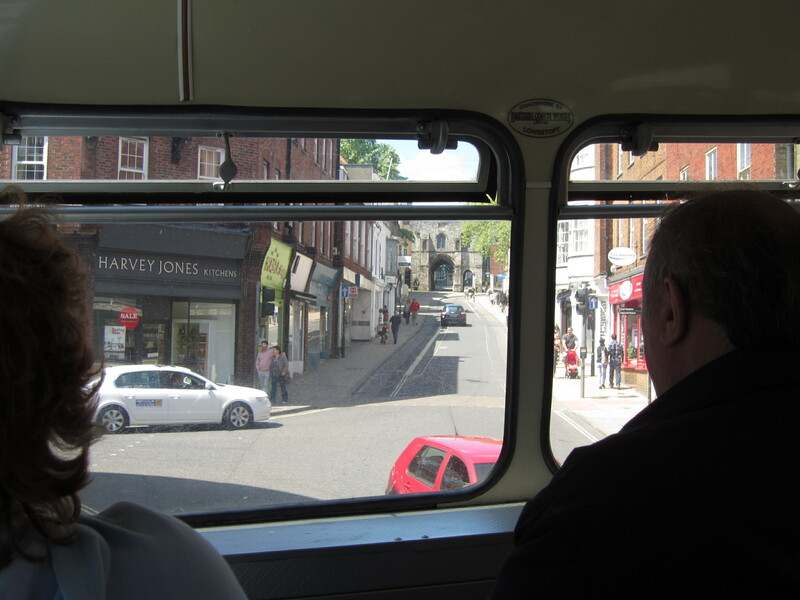 Re-joining the A25 on the one way system, we’re now on Reigate High Street about to squeeze past the old Town Hall. 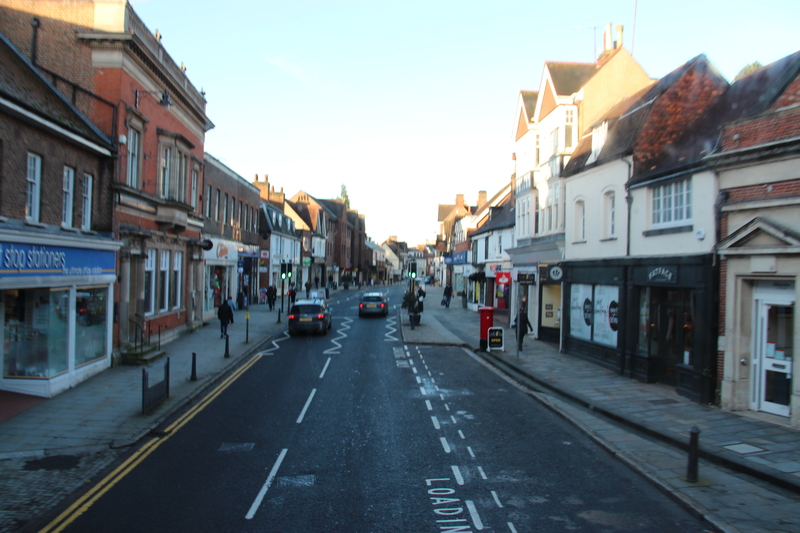 Westbound along Reigate High Street. 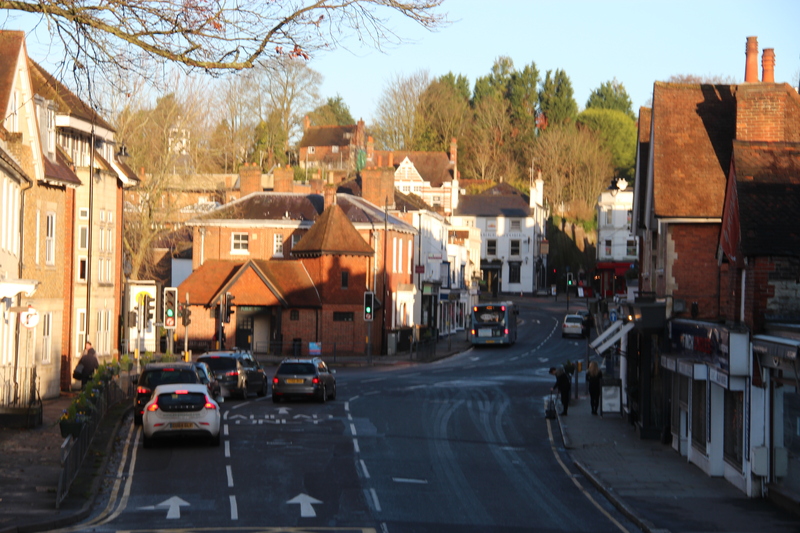 The A25 continues ahead to Dorking and Guildford, we’ll turn right to follow the A217 towards Reigate Hill. 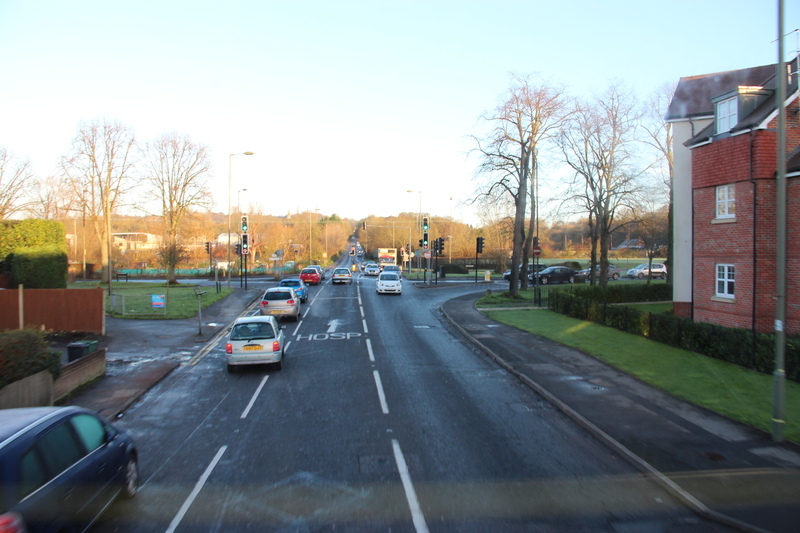 Still on the one way circuit but now heading north. 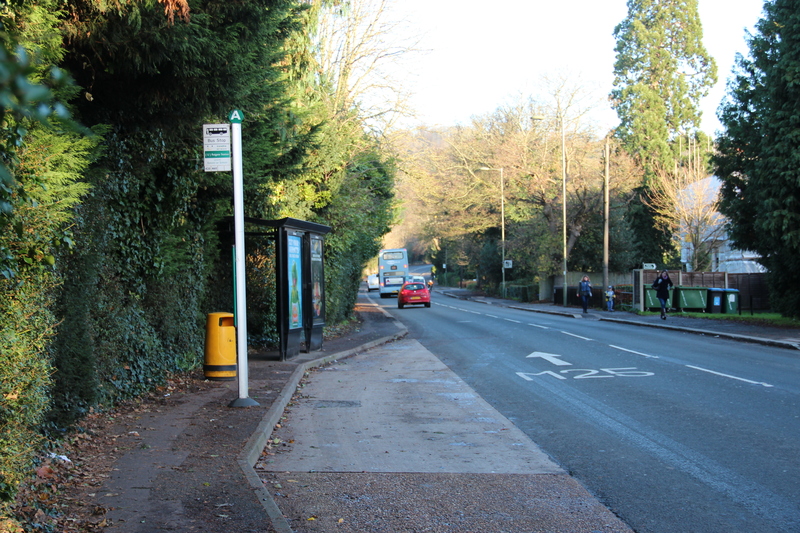 The bus shelter on the left has only recently replaced one which dated from the 1920’s erected by the London General Omnibus Company. 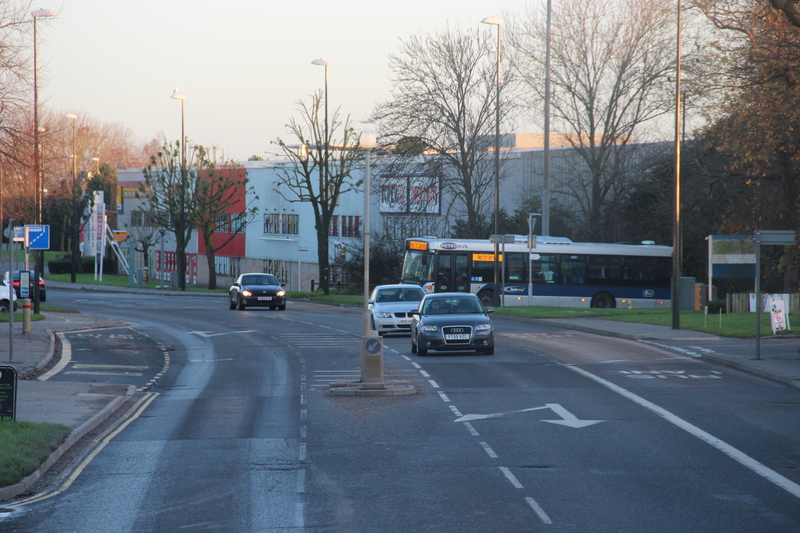 We’re now leaving the one way system as our road becomes the A217 London Road, while the route to the right continues as the A25 towards Redhill. 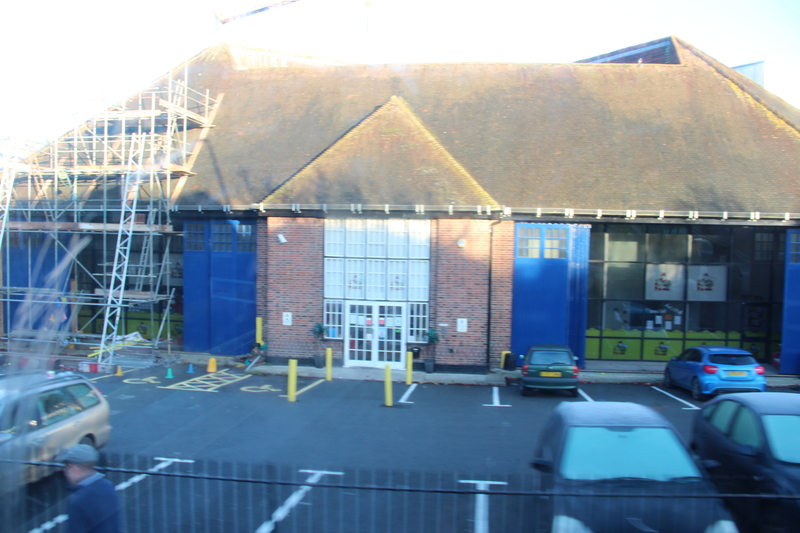 Approaching journey’s end now as the signal box and level crossing at Reigate Station come into view. 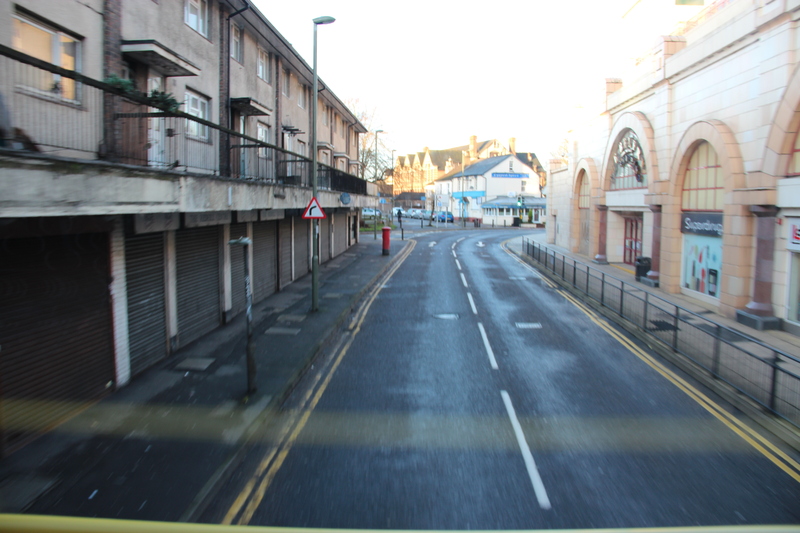 Approximately one hour after leaving Crawley we’re at the end of the ride. 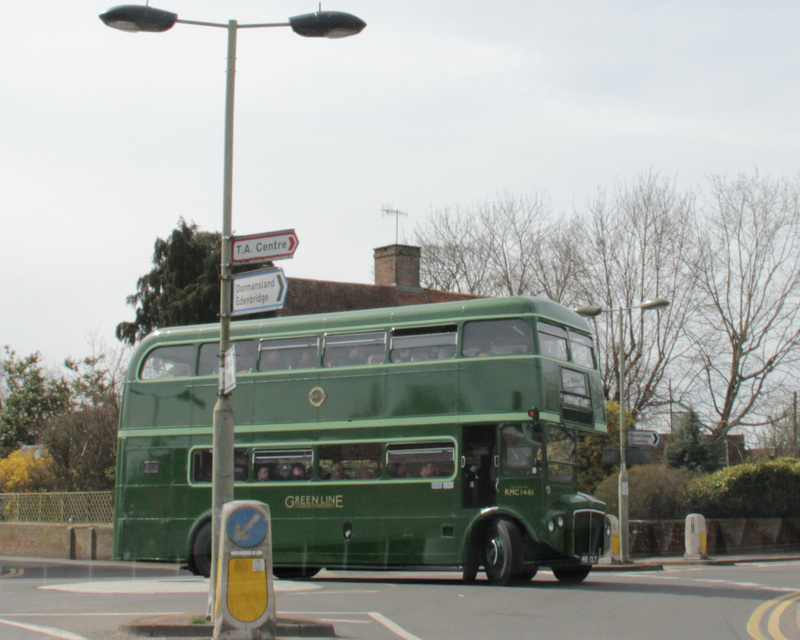 Our 460 makes it’s way up Reigate Hill to Epsom via Kingswood, Tadworth and Tattenham Corner. 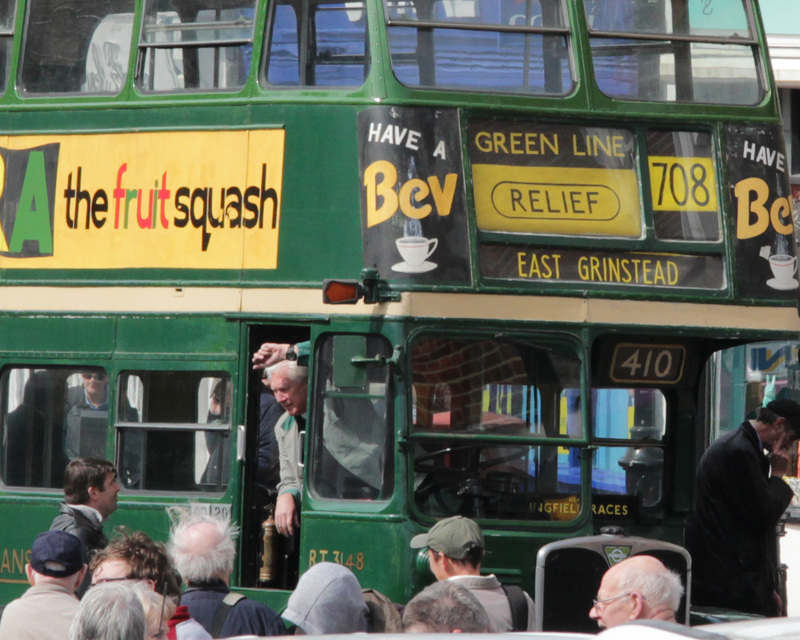 The first unfortunate creatures in this category to hit the streets of London were the AEC Merlins in 1967. 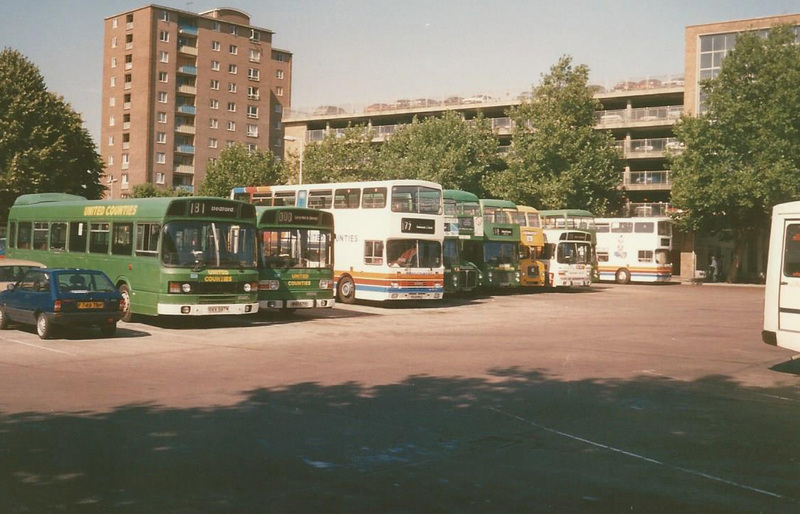 I use the term “unfortunate” because in my observations there really wasn’t much that was wrong with these buses, they were just the wrong type in the wrong place. 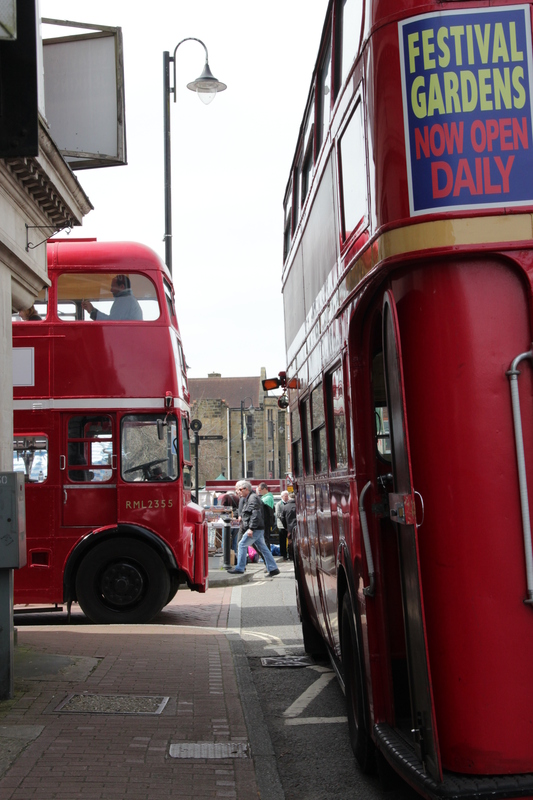 This was the result of a decision forced upon London Transport in the mid 1960’s by the government to buy “off the peg” models and save the cost of designing their own. 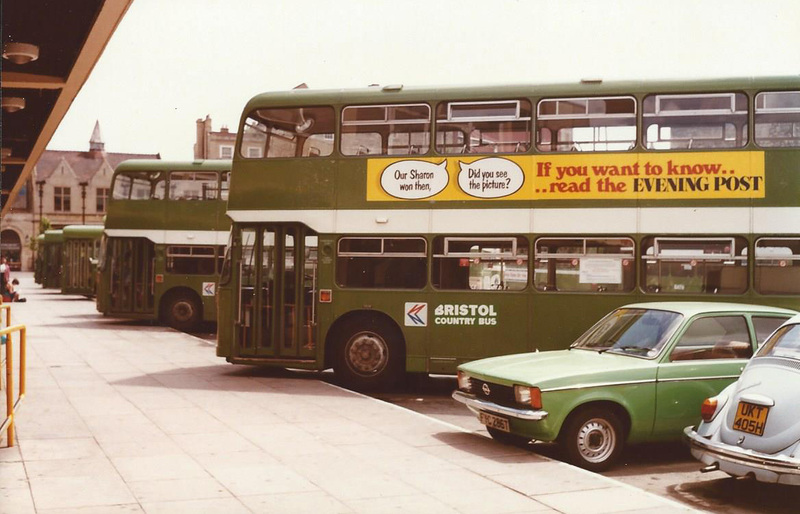 The Merlin was a version of the AEC Swift chassis, admittedly not one of AEC’s most successful products, but it managed to find several satisfied operators elsewhere across the UK. 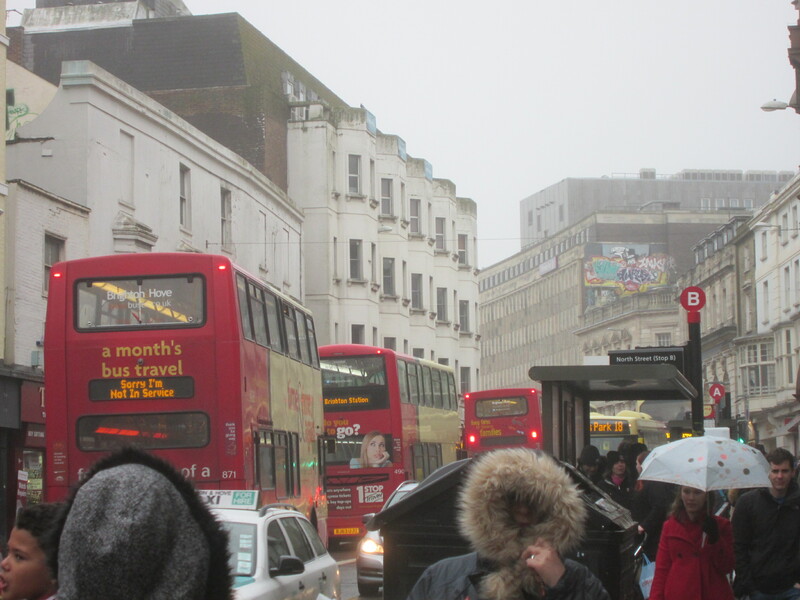 The London version came in three variants. 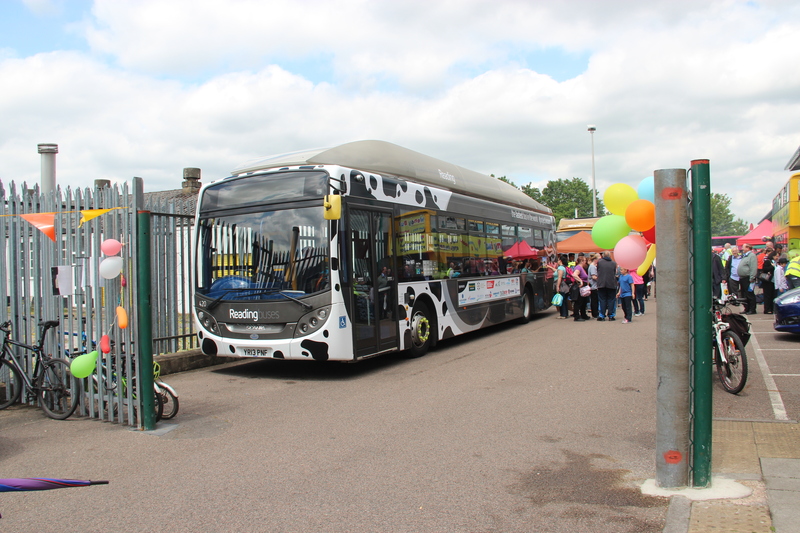 Firstly the MB, a 36 ft long 50 seat single door bus to be used as a conventional driver only single decker. Perfect for the job so it would seem. 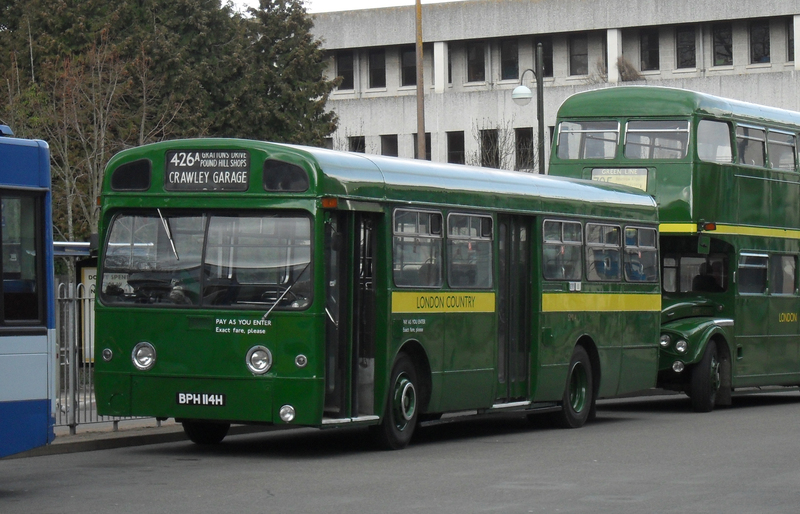 A two door version was supplied to the country area, some replacing RT double deckers on town services, others replacing RF single deckers on rural routes. 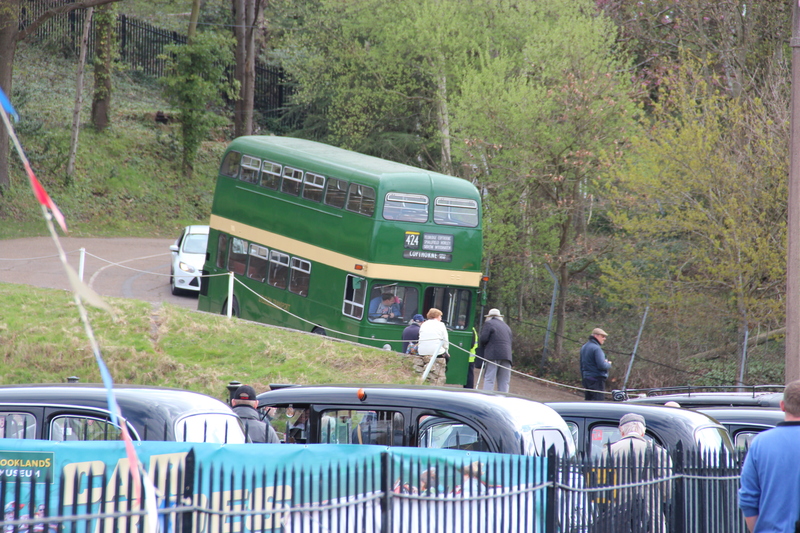 The trouble in all cases was that at 36 feet they were just too long for the roads along which they operated. 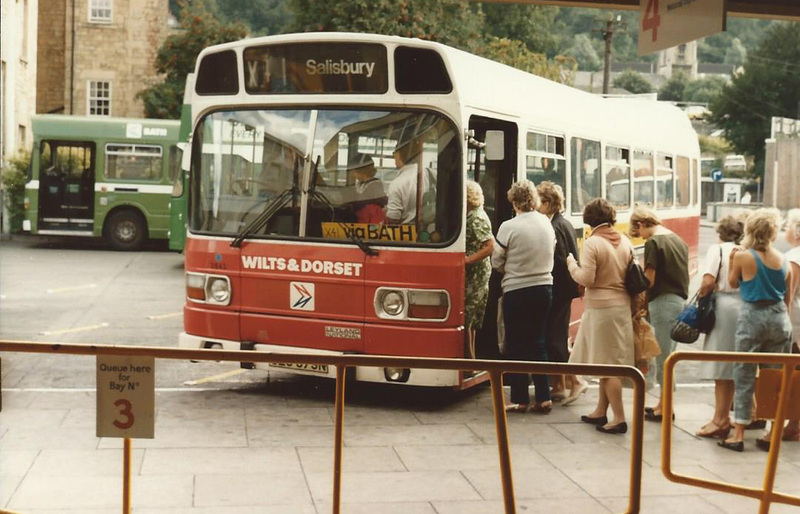 Next came the MBS, designed as high capacity people carriers with the emphasis on 34 standing passengers in the front section and seating only 32, mainly at the rear. 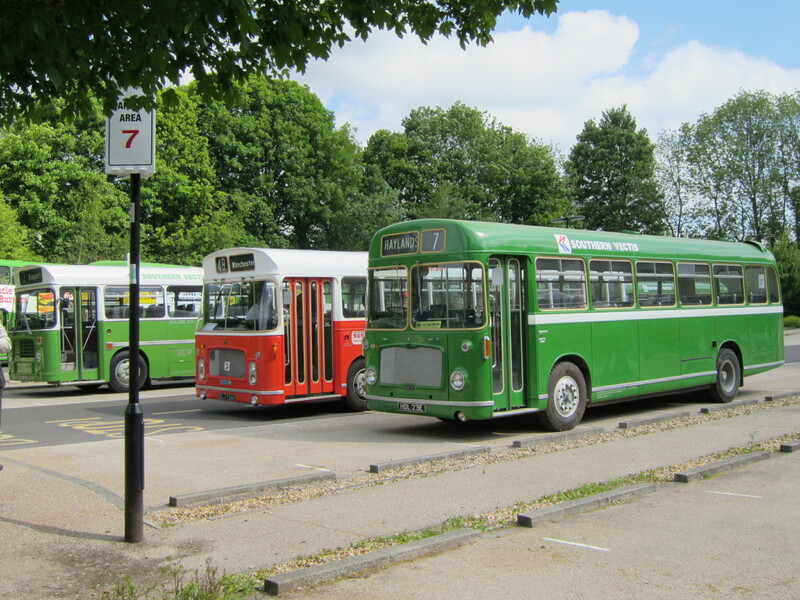 Their intended use in the central area was on short hop local journeys and in the country area on town services with “Autofare” self service ticket machines where they soon became referred to as “cattle trucks”, especially after the Autofare machines were removed and the MBSs found their way onto longer rural or trunk services where again their length, along with their minimal seating capacity proved problematical and unpopular. Finally, the MBA class to which I’ll return shortly. 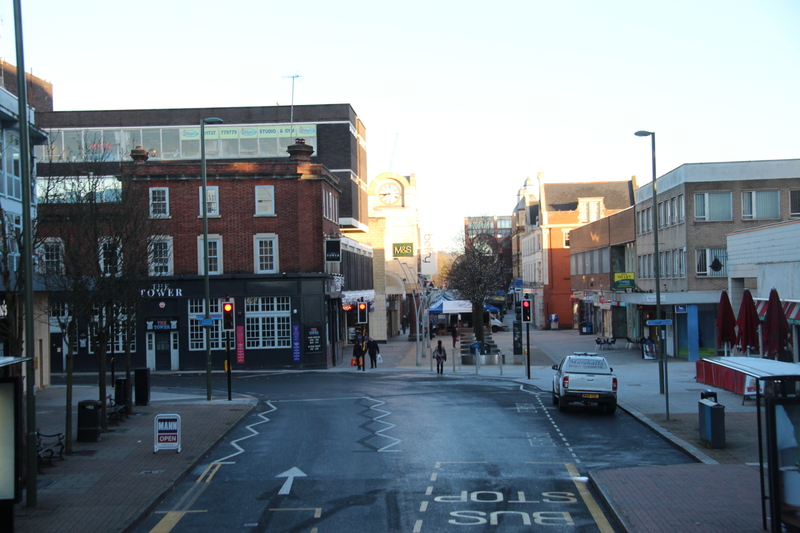 So, back to the MBA class, built for and run exclusively on the central area RED ARROW express services, linking several London main line rail termini with shopping or business areas. 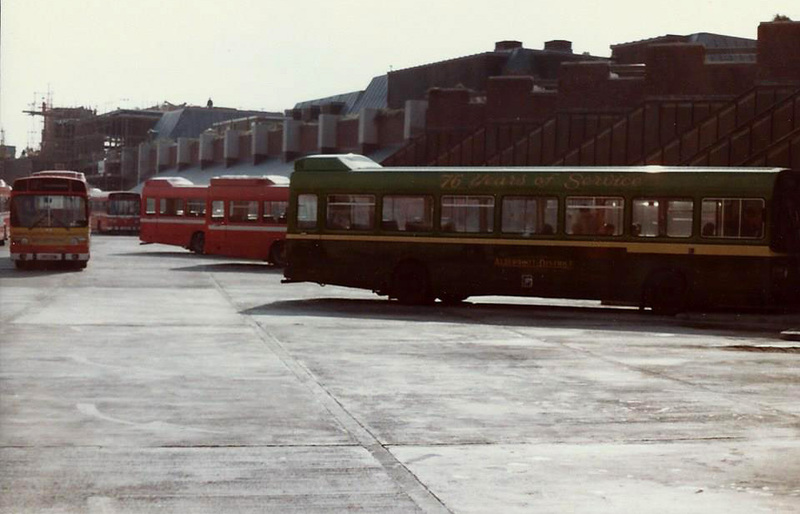 Although seating only 25 at the rear, the vast space at the front providing standing room for 48 made them the most perfect inner city people carriers of their time and the RED ARROW services were an instant success. 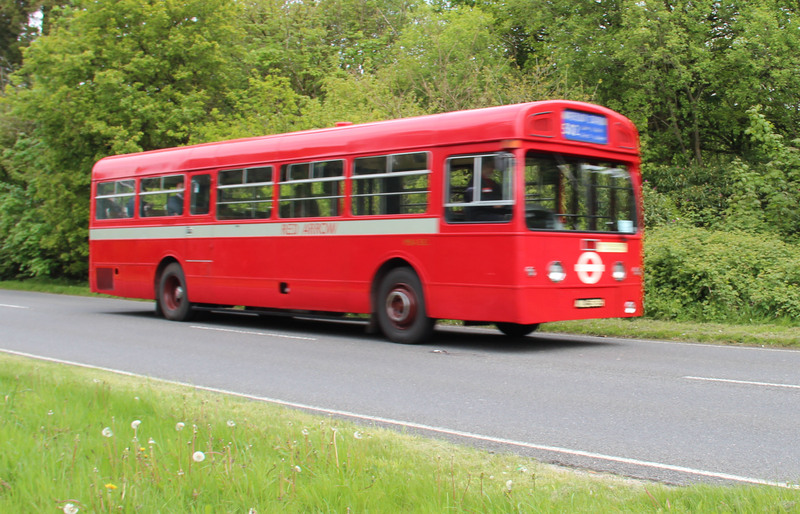 The MBAs seemed to thrive on these services, especially on route 500 where for nearly twelve years they whizzed passengers up and down Park Lane on a punishing schedule between Victoria and Oxford Street, not bad for a supposedly unreliable vehicle! The 36 feet length problem was addressed when a shorter version of the Merlins, the SM/SMS classes arrived in 1970 but like the MBs were similarly deployed where they couldn’t fit in. LT just didn’t like them. 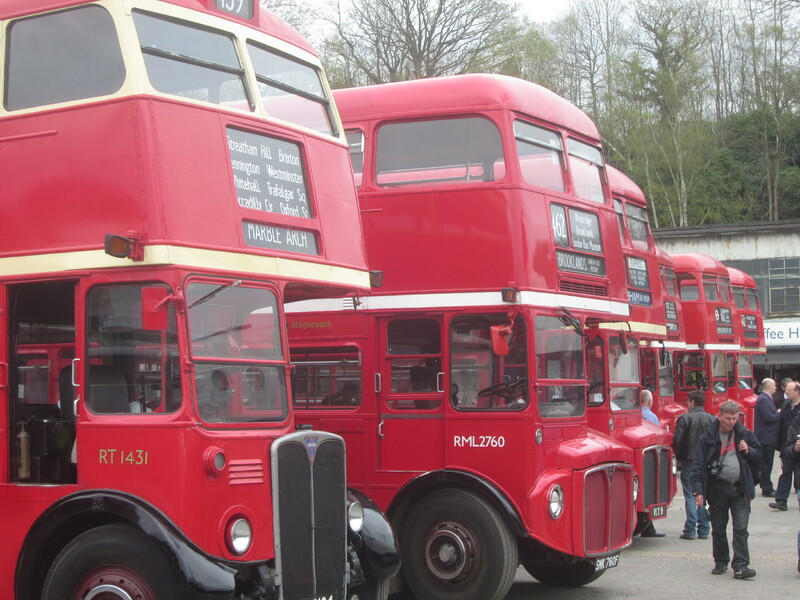 By this time double deckers were back in fashion and the notorious DMS arrived to be loathed just as much as the Merlins and dogged with the same unreliability. 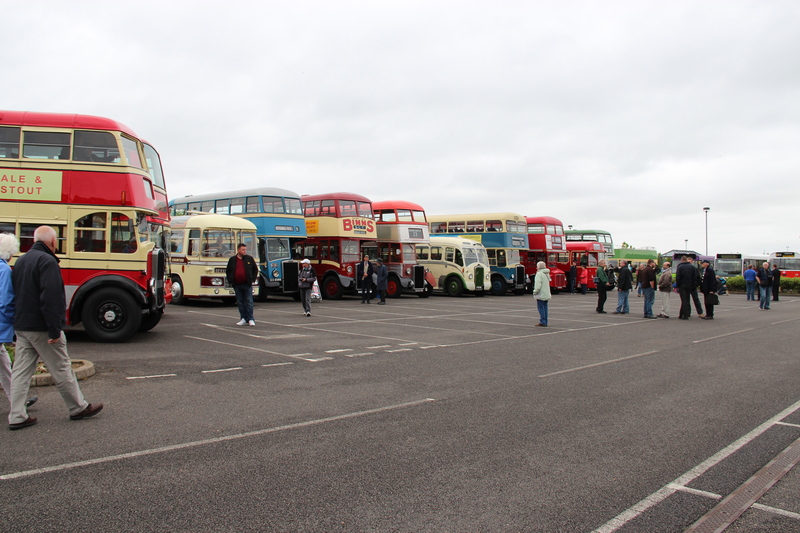 But these were Daimler Fleetlines, they worked perfectly well in other cities so why not London?